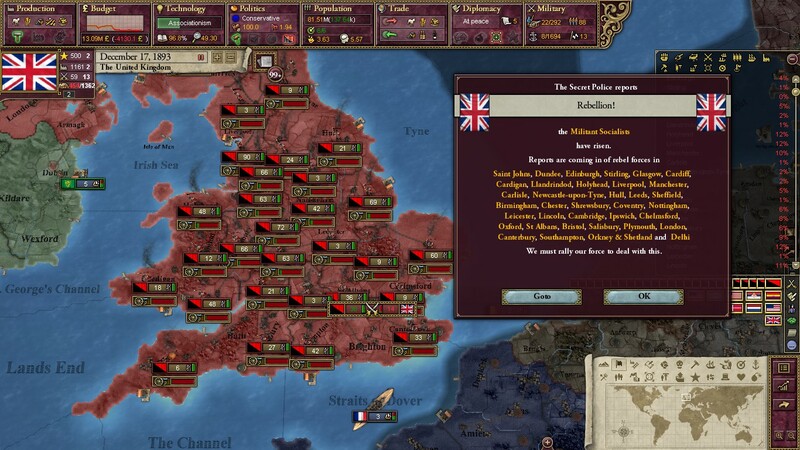 A "situational" Victoria 2 AAR in which I destroy the United Kingdom on purpose and attempt to rebuild the British nation. On May 4th, 1891, full-scale war erupted in Europe for the first time in more than seventy years. 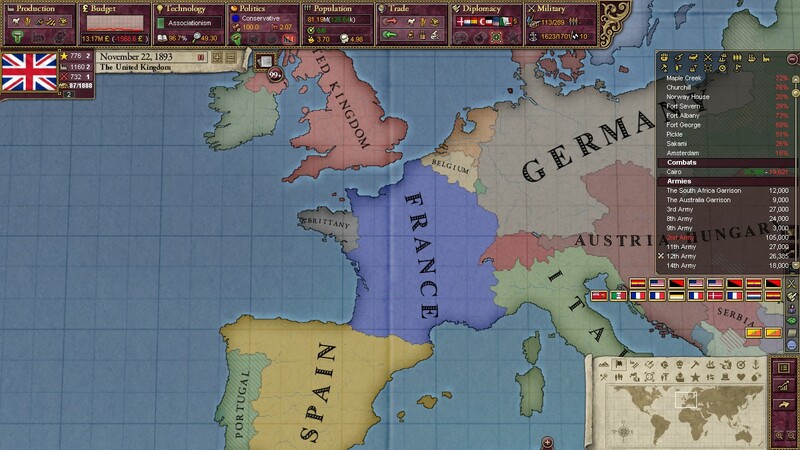 In early April, the Republic of France reaffirmed its right to Alsace-Lorraine, citing the need to protect many French citizens living in the province that the German Empire had annexed twenty-five years ago. In a statement to the German people in the very next day, Kaiser Wilhelm II declared his intention to defend Reichsland Elsaß-Lothringen with force if necessary. 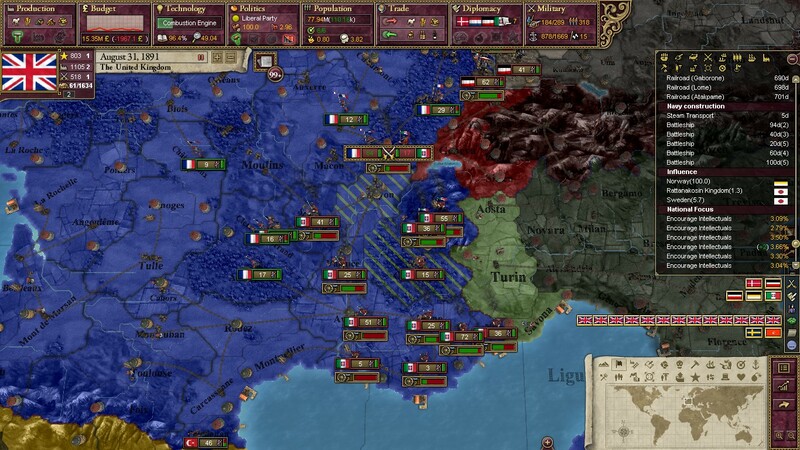 France mobilized. 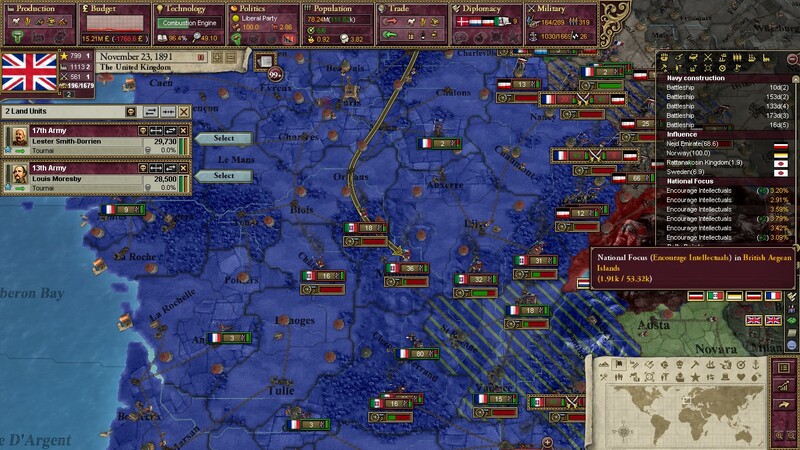 The Russian Empire, France's ally, mobilized. 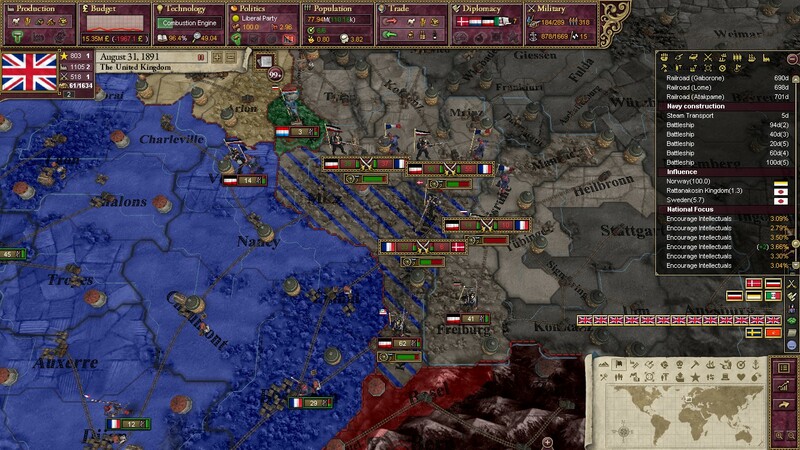 Germany (and their ally, Italy) were already mobilized due to an ongoing conflict with Austria-Hungary, but as the war against the Habsburg Empire was winding down, troops were shipped to the borders of France. War was inevitable. 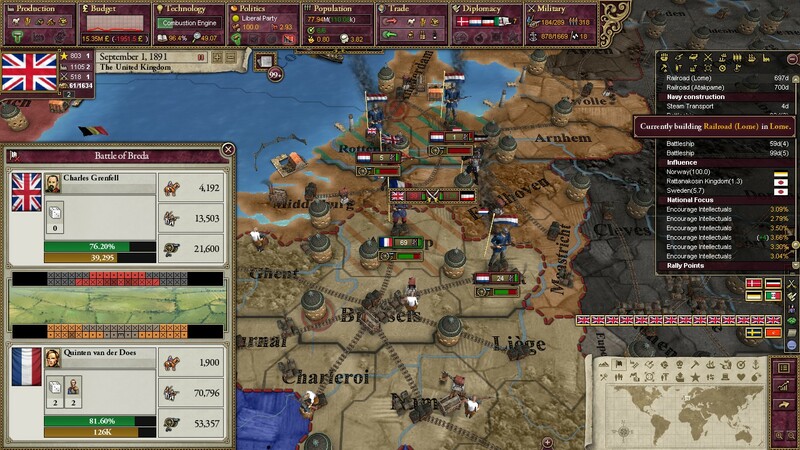 When the Republic of France issued that infamous declaration on the 4th of May, the continent exploded. 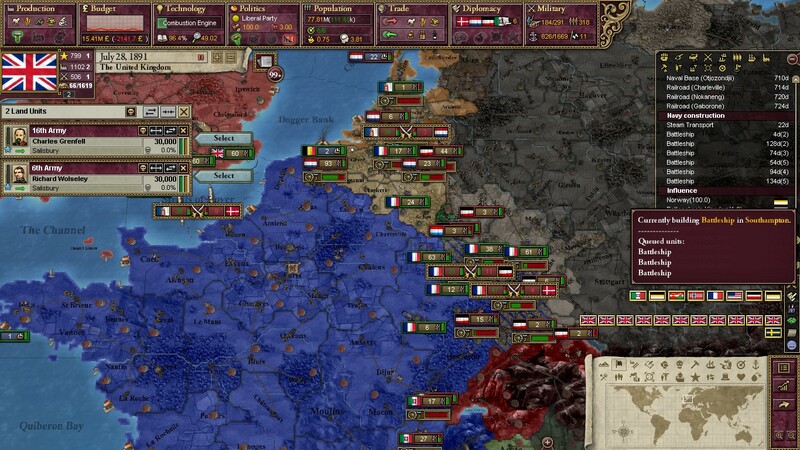 Germany, Italy, Denmark, and the Netherlands declared war on France, Russia, Portugal, and Belgium in response to French aggression. They became known as the "Central Powers." 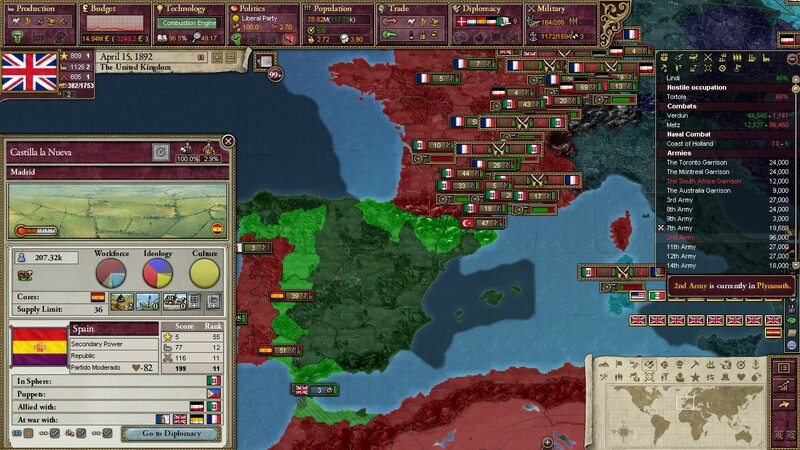 While the Republic of Spain was pressured to join the war by the Kaiser, the nation declared that it intended to be neutral in the conflict. 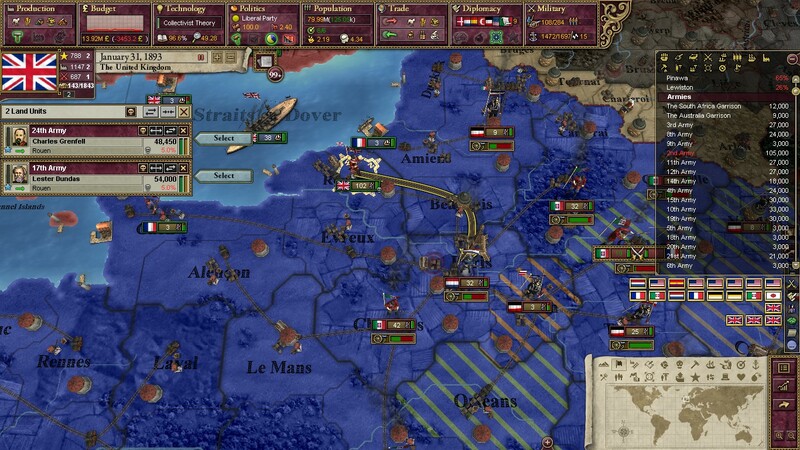 France, Belgium, Russia, and Portugal became known as the "Entente." 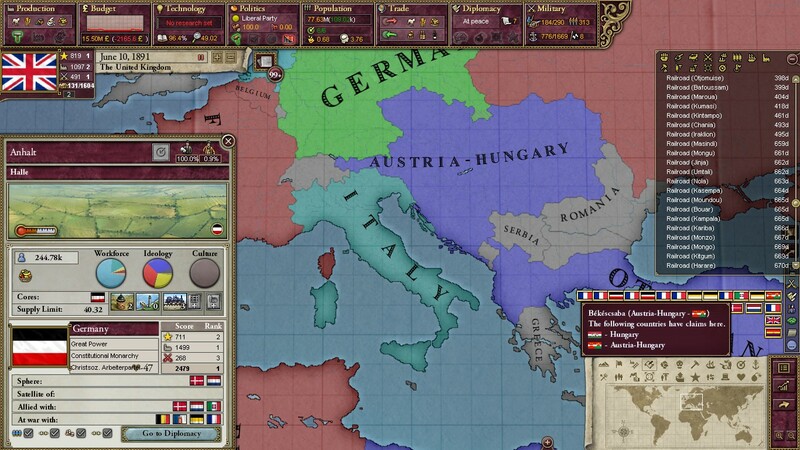 Austria-Hungary and their Turkish allies refused to join into an agreement with the Entente, citing growing war exhaustion among their diverse populaces that might lead to a complete splintering of their empires. This, of course, left one "Great Power" out of the mix: the United Kingdom, with His Royal Majesty King Charles III, son of the late Queen Victoria, on the throne. Since the end of the Napoleonic Wars, Britain had achieved an almost unrivaled period of imperial dominance. Led for nearly twenty-five years by the broadly supported Liberal Party (and long-time Prime Minister William Gladstone), the Brits had conquered the waves of the world. In Africa, British possessions ran from Lagos to Mogadishu to Cairo. 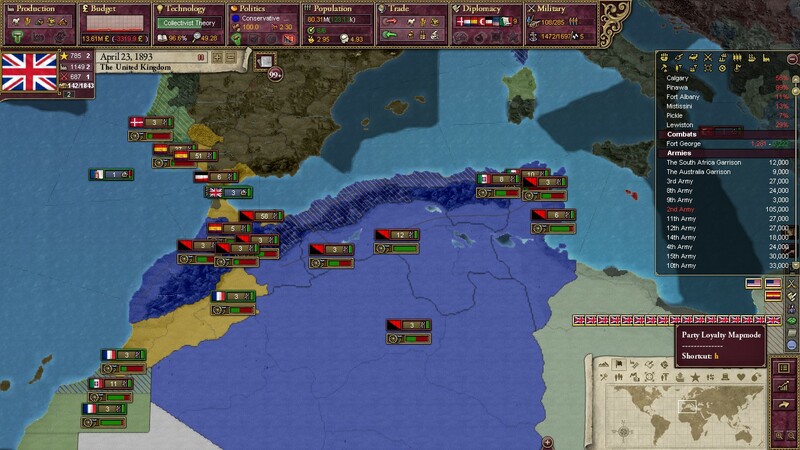 The Suez Canal, the great linchpin that held the far-flung empire together, was an important cog in the machine that had lead to several wars with France, who had initially established the Suez Canal Company and therefore claimed they had rights to it. Yemen was ruled directly by the Crown as a way to regulate trade flowing through the Horn of Africa, and the Sultanate of Oman and the Saud family of Arabia were both close allies as well. 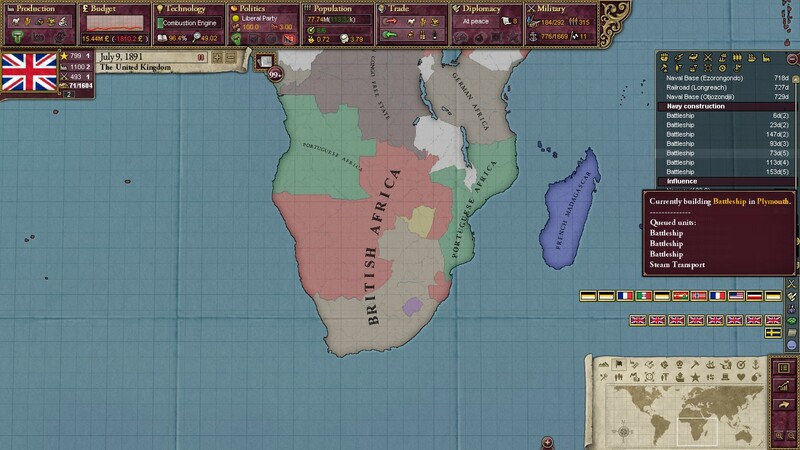 The UK also held dominion over the southern part of Africa. The Union of South Africa, established just three years prior due to conflicts between Boers and Brits, controlled much of the territory settled by the Boers and had a limited amount of autonomy. 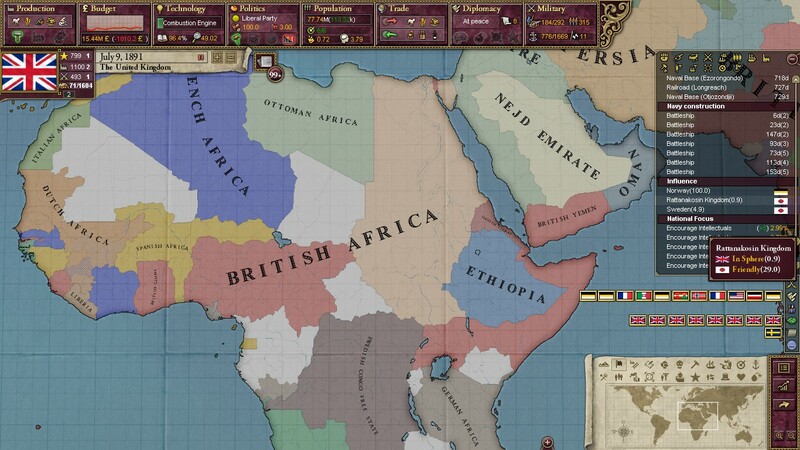 Further British colonies stretched northwards into the African heartland. Other territories proudly flew the Union Jack as well - Canada, Australia, New Zealand, British Honduras, the Caribbean. And, of course, India. The entirely subcontinental region from Afghanistan to Burma was united either under direct control from London or a puppet regime. Through the first month of the continental war, William Gladstone proclaimed Britain's neutrality, citing the fact that Britain did not have formal military agreements with either Russia or France. 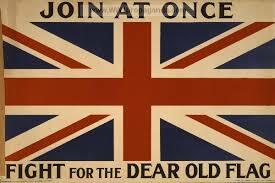 France, he added, had spent the last century fighting Britons whenever they got the chance. Britain, of course, did not remain neutral for long. Talks had been ongoing with the Russian Tsar for nearly a year about a possible agreement between the two powers. While relations between London and Paris were frosty, Moscow was willing to compromise. ...and in early July, his hand was forced. A popular German newspaper published a massive story that exposed horrendous crimes of the British colonies in Nigeria, but particularly in Lagos. Several German reporters went undercover and managed to compile a damning case against the brutal colonial practices of the British. The article, quickly translated into English and published all over the world, served to intensify anti-German sentiment in the nation. 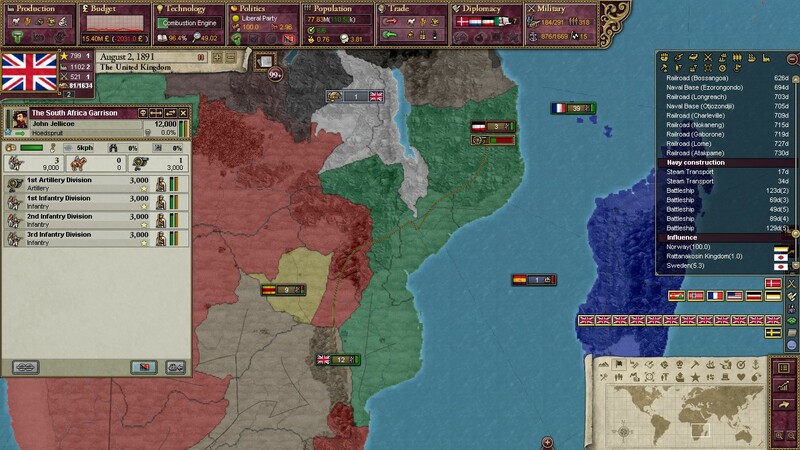 With Germany and Britain locked in several colonial battles in Eastern Africa, the article was seen as a piece of government propaganda aimed at furthering the goals of Berlin. The Liberals and William Gladstone were then faced with a choice: they could either back down, accept responsibility for atrocities committed in Africa, and attempt to reform colonial governmental structures. However, Gladstone instead gave a speech condemning the report as "utterly baseless," and designed to undermine British legitimacy in Africa at the expense of German gains. By this time, both the Liberals and the Tories had largely rallied around the idea of intervention on the side of the Entente. 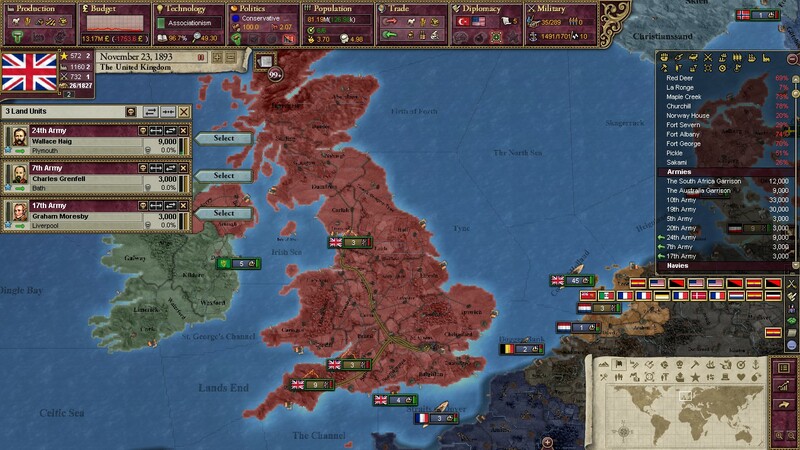 On July 27th, 1891, the United Kingdom declared war on the Central Powers, stating their need to "contain the rapid expansion of the German Empire." 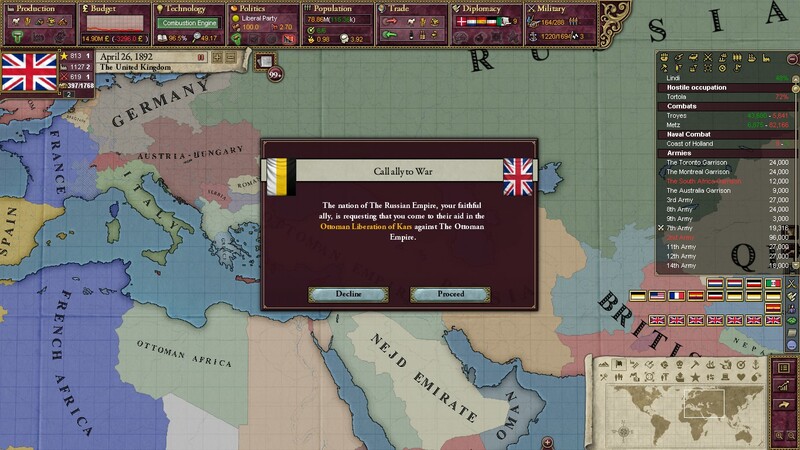 Secret deals were struck between Britain and Russia; the Great Game was all but given up by the Tsar, who agreed to give up any ambitions they had on Afghanistan. Across the British Empire, men began to train. 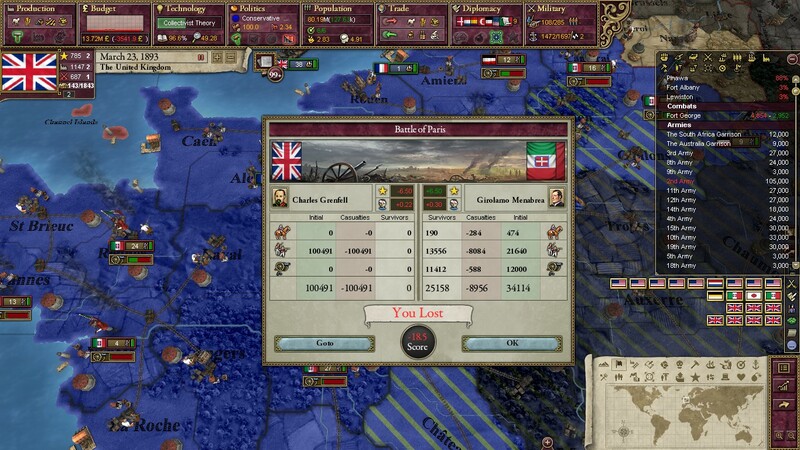 The Great War was on. As British soldiers boarded their troops transports and prepare to land in Normandy, the situation of the Western Front was assessed by British intelligence. 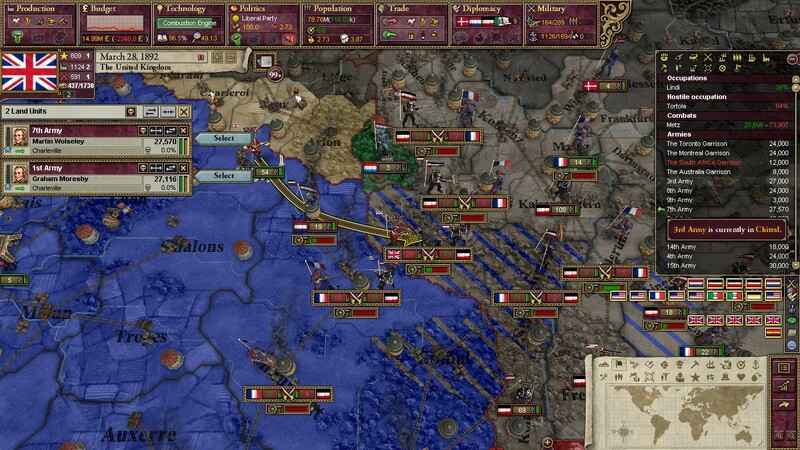 While the French managed to seize many important areas in Alsace-Lorraine in the early days of the war, the Italians quickly overran French defenses in Savoy and poured into the plains of Southern France. 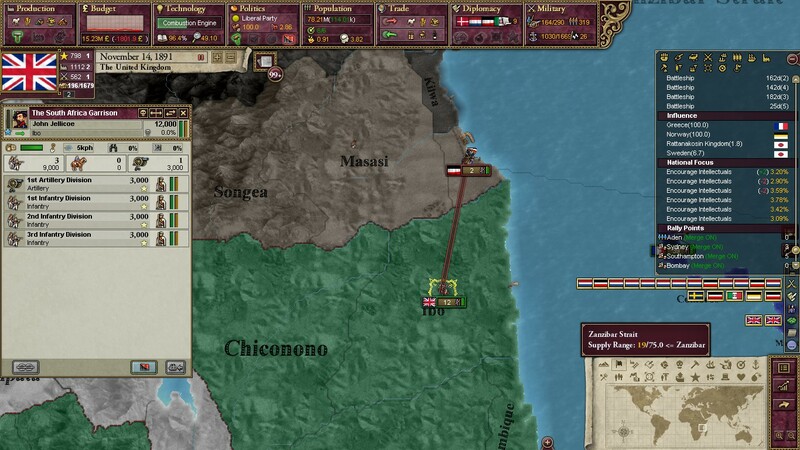 The first official move for the British was straightforward: they sought to dismantle the small German garrisons in Tanganyika. The South Africa Garrison was sent to the north. 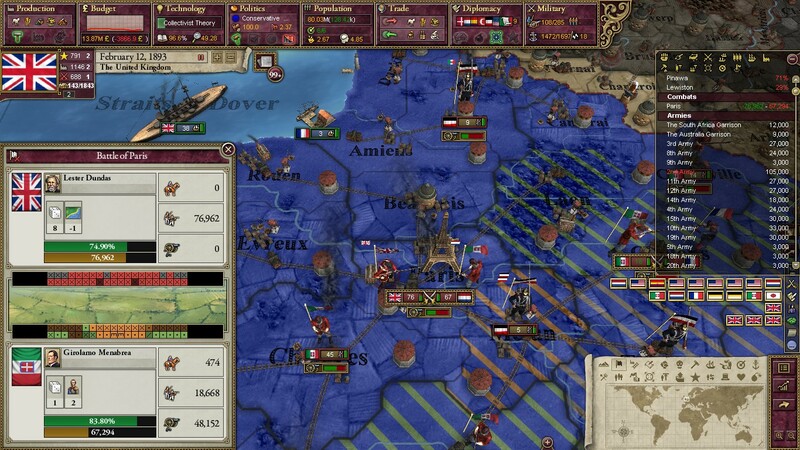 The French and the Dutch scuffled a but in Africa, but fighting outside the continent was mostly minor in the early months of the war. By early August, the 6th and 16th Armies had landed on the continent. In an effort to keep the offensive against the Germans going as strongly as possible, the British troops were sent to the Netherlands. Charles Grenfell, leader of the expedition, elected to attack a German garrison stationed in Breda, a city close to the Belgian border. There, the inexperienced 6th and 16th marched straight into a deathtrap. 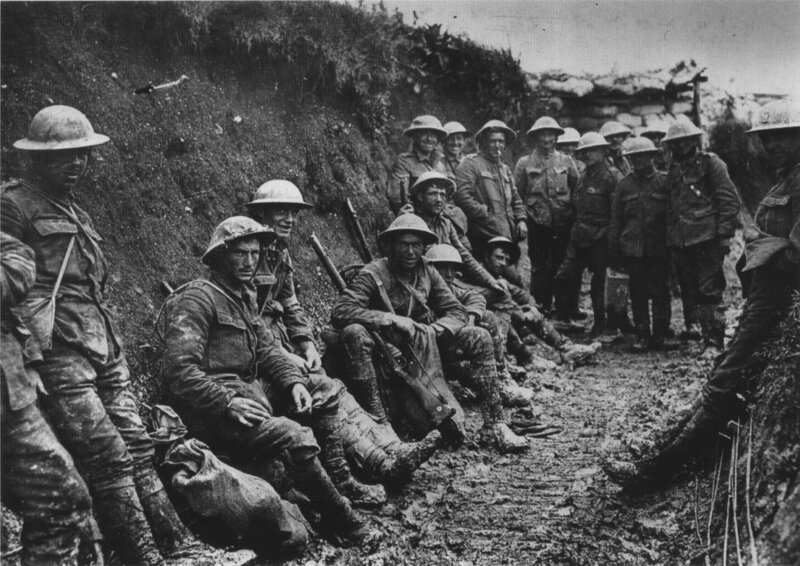 Germans troops dug trenches and used machine guns while the British marched forwards in scarlet uniforms. 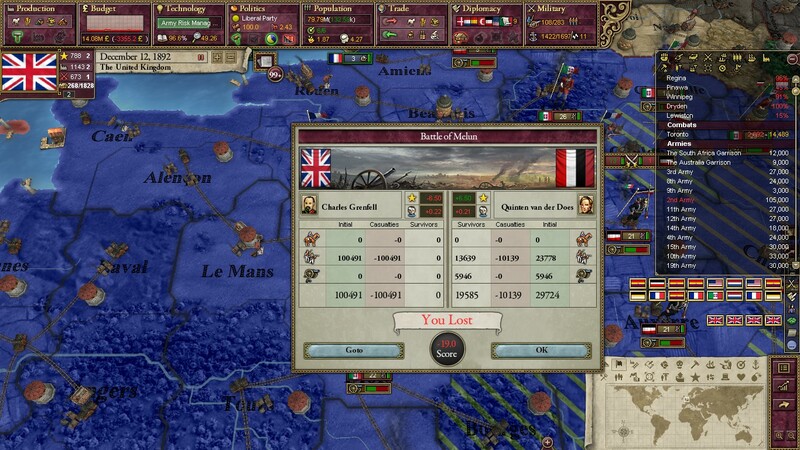 Despite being outnumbered, the Germans held their ground. The French push into Alsace-Lorraine had slowed to a crawl. As German troops were transferred from Austria-Hungary, French numbers in the region were soon overwhelmed. 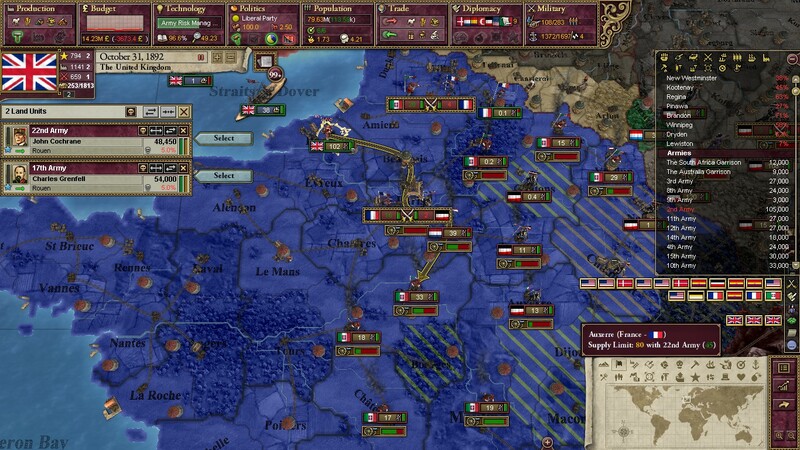 The situation in Occitania, however, was even more dire. The French had been on good terms with the Italians since they had aided in the Risorgimento, and so had not thoroughly fortified the Italian border. Crossing the Alps proved to be an easier task than many in the Italian high command had once thought. While General Charles Grenfell had initially held up quite well against the superior German defenses, a massive Dutch reinforcement joined the German troops holed in Breda. As Grenfell prepared a retreat, a third Dutch force appeared at their rear. The 6th and 16th were utterly trapped. The First Battle of Breda was an unmitigated disaster for the Royal Army. Two entire armies wiped from the government's ledgers caused no end of problems for William Gladstone's government in Westminster, which remained entirely pro-war. Behind the scenes, a movement began to form: an anti-war coalition of the fringe Labour Party, a social democratic faction that held few seats in the House of Commons, and the "Lib-Labs," or the Liberals that learned the most to the left. This loose coalition pledged itself against Gladstone and against the war. It was, at first, called "The British Society for Peace in Europe." Only later did it take on the more popular name "The British Republican Front." 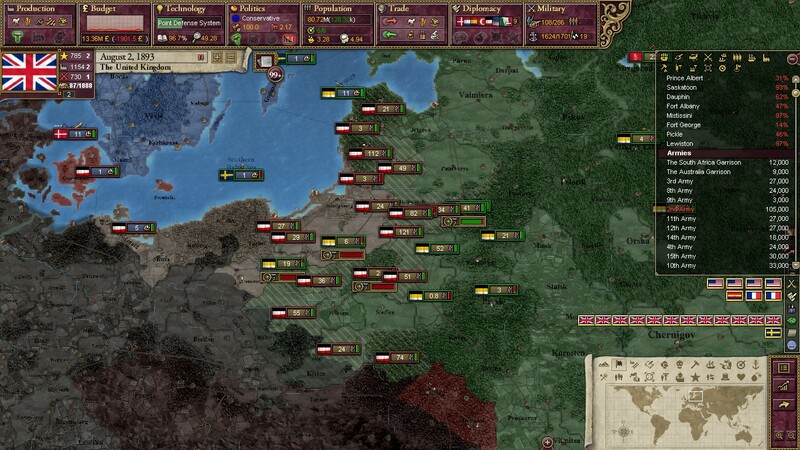 The Germans also made a small push into Russia, capturing a significant amount of Polish land by the fall. A poorly-timed drought and famine had struck the Russian heartland in the summer of 1891, further worsening the position of the Tsar. 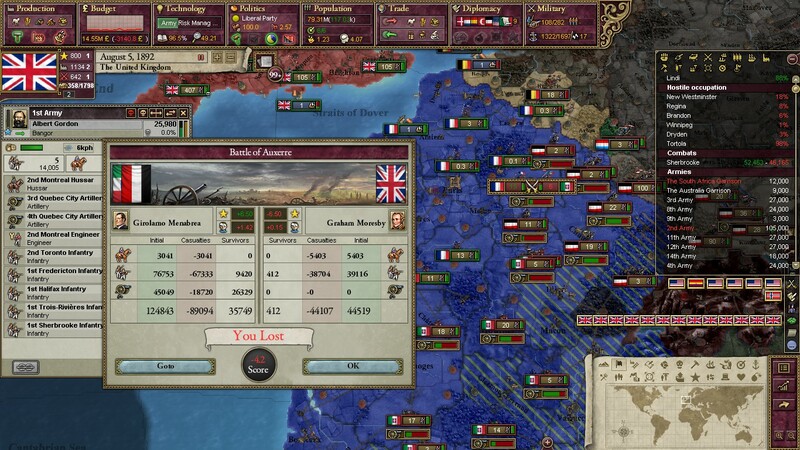 A second British force landed in France by October. 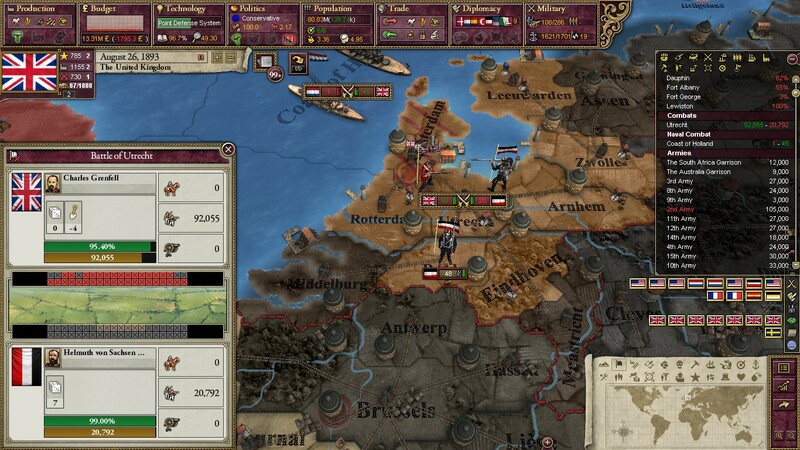 Once again, it made for the Low Countries; this time for German positions in central Belgium. Another group of armies was sent to Southern France to attempt to combat the Italians, who continued to make gains (albeit at a slower rate). 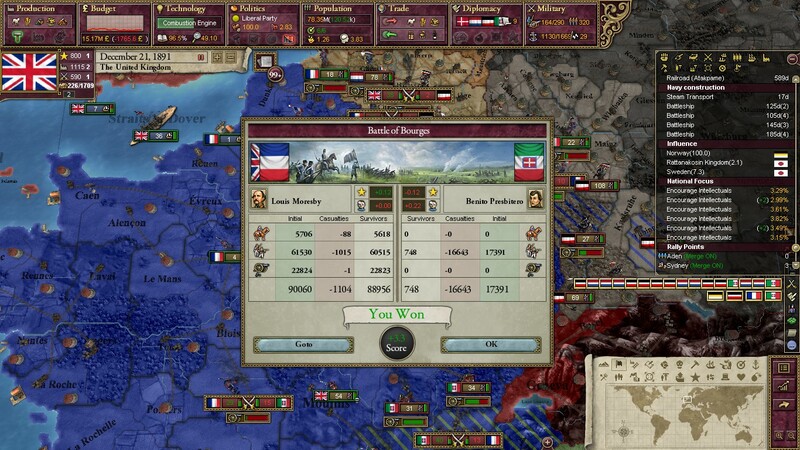 The first battle between the Royal Army and the Kingdom of Italy was a decisive victory for the Entente in the Battle of Bourges. In a speech made just after the New Year, PM Gladstone exalted this victory as "The clear and proper forward for our army." 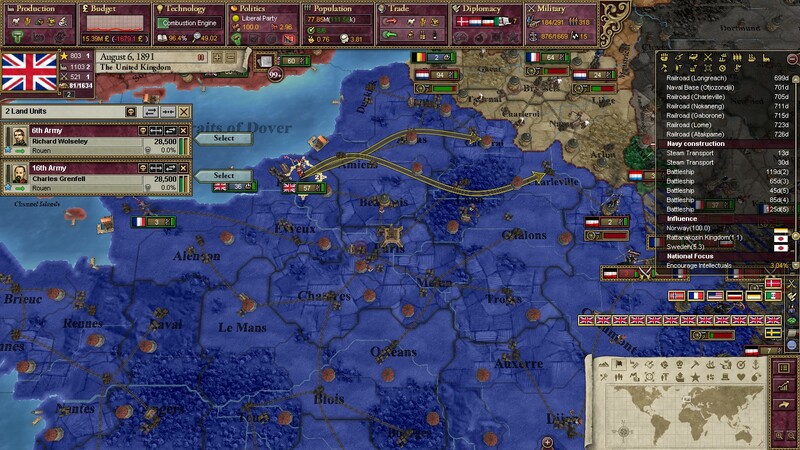 As the British were still on the way to the German positions in Belgium, the Entente is shocked. On January 3rd, 1892, Belgium capitulated to the German Empire, opting for peace in exchange for reparations and disarmament. 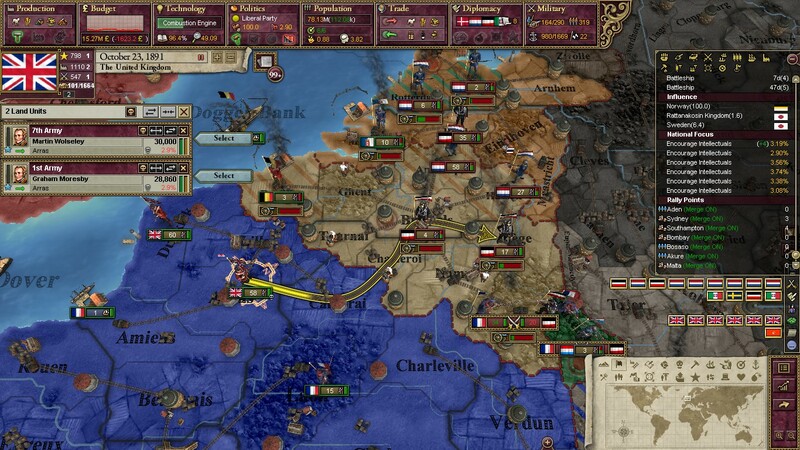 The Disaster of Belgium haunted the Entente in the upcoming months, who began to seriously feel as though they were on the back foot. While the Italians had been somewhat slowed down to the south, Alsace Lorraine was still vulnerable. Just a few months after the French had liberated it, a new series of German armies came to sweep away the invaders. Louis Moresby, Commander of the 13th and 17th Armies and hero of the Battle of Bourges, elected to try and dislodge the German position in Metz. 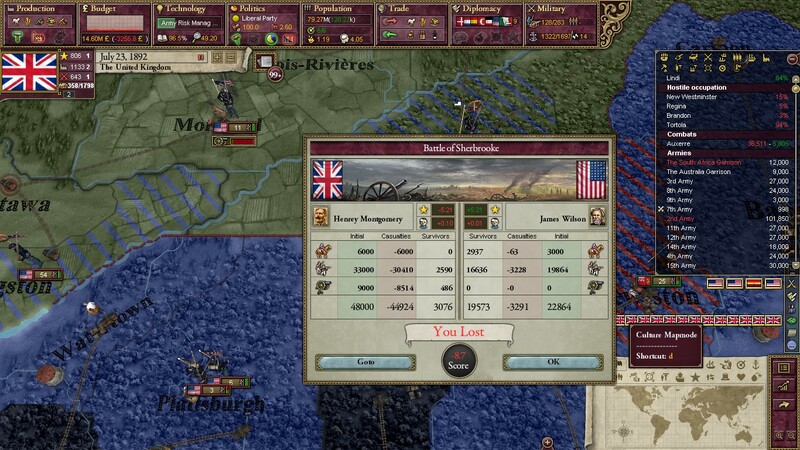 Once again, the Brits made a convincing first much. Dutch General Quinten van der Does, who had humiliated the Royal Army at Breda, had arrived once more to tip the scales. 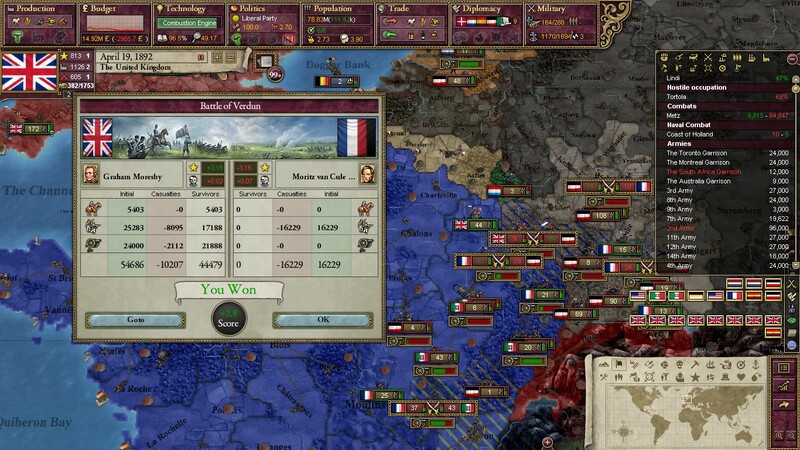 The Battle of Metz began an unending slog. Both sides struggled to gain an edge as the battlefield was pelted by snow, rain, and artillery shells. By March of 1892, enlistment was dramatically decreasing as public approval of the war was plummeting. The leader of Labour in Parliament, Keir Hardie, officially supported British withdrawal from the war by April. Liberal MPs like Charles Dilke and Charles Bradlaugh also began to voice discontent with Gladstone's war effort. For the first time in nearly a decade, widespread violence in India began in the city of Madras. The Sepoy Rebellions of the 1860s and 1870s had nearly pushed British influence off of the Indian subcontinent completely until the July Settlement between several Indian princes and the Crown had brought an end to the hostilities. Indian civilians were promised increases rights by Queen Victoria, who was also given the title "Empress of India" as part of the agreement, beginning the "British Raj." Openly anti-British demonstrations occurred in Bombay, Madras, Calcutta, and Delhi. 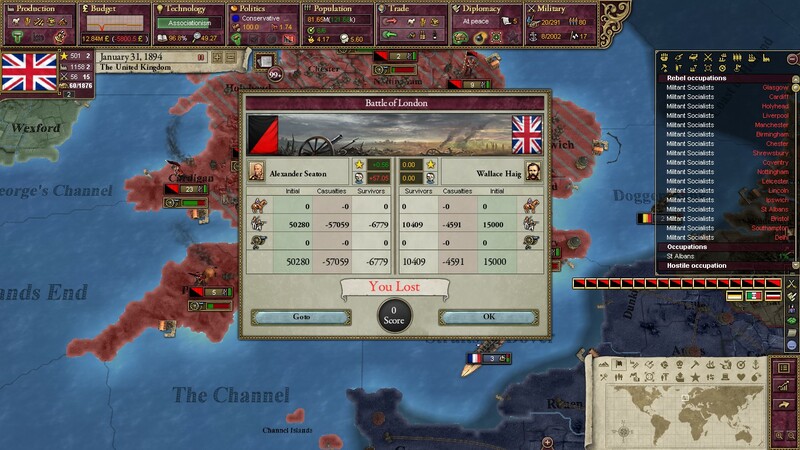 Back in the Europe, the British position in Metz looked doom to fail. The 1st and 7th were sent on a desperate mission to relieve the stranded army. While the Western Front was failing, the Tsar had begun to beat back the Germans in earnest. 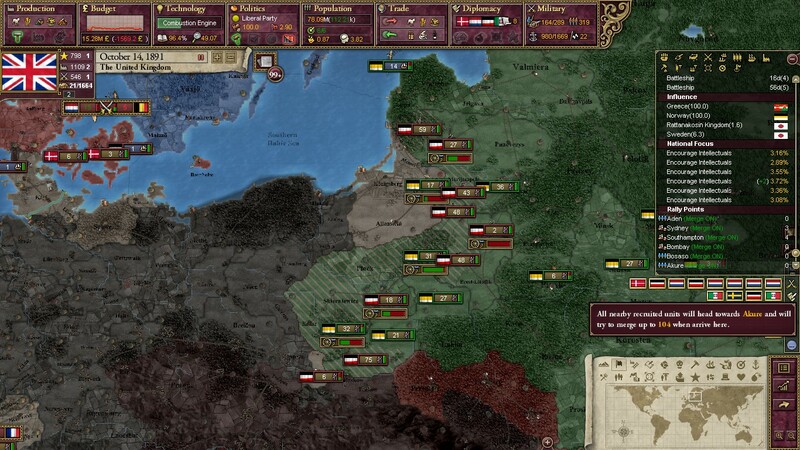 The Russians took back much territory in Poland and the Baltics and ever began to push into Silesia and East Prussia. 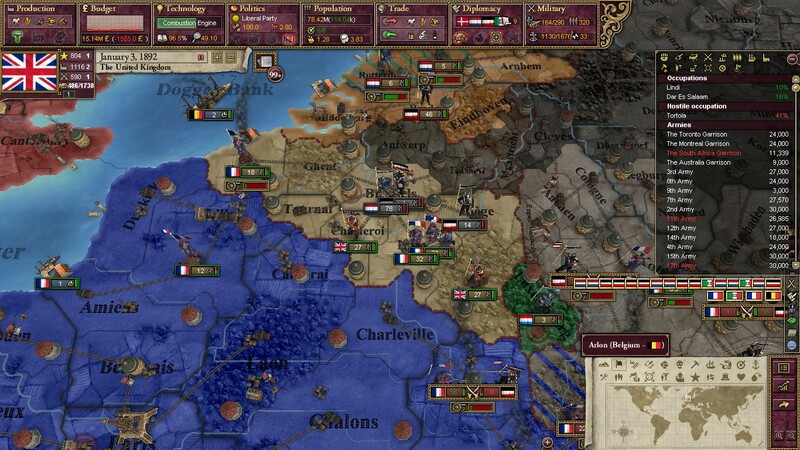 On April 15th, the first of the three late interveners turned on the Entente. 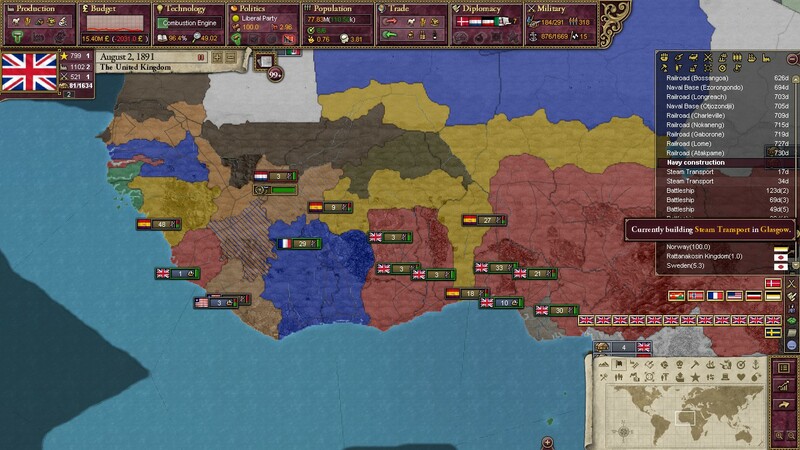 Smelling blood in the water, the Spanish Republic joined the war on the side of the Central Powers, seeing Portugal and France as colonial enemies that had interest in Spanish Africa. The Spanish invasion of Portugal tied down the minor power, leading to Portuguese troops that had once occupied half of the Netherlands to return back to their homeland. On the way to relieve the troops in Metz, the 1st and 7th met a smaller German-Dutch army in Verdun. 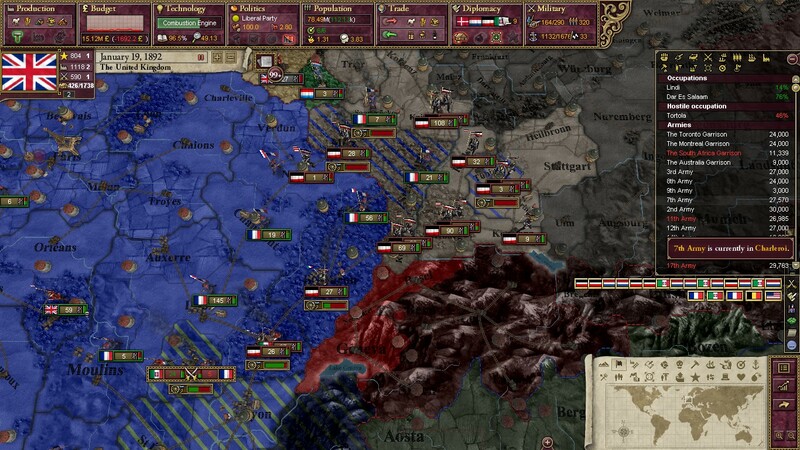 The Central Powers, severely underestimating British infantry, were smashed and utterly routed. On April 26th, 1892, the Ottoman Empire declared war on the Russian Empire, desiring a long-disputed border territory. 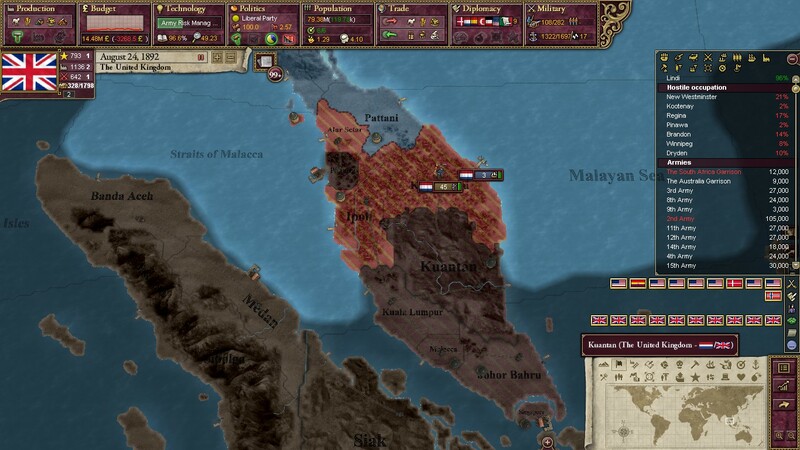 While the Sultan was no friend to the Kaiser, he saw Russia's weak position as an opportunity. 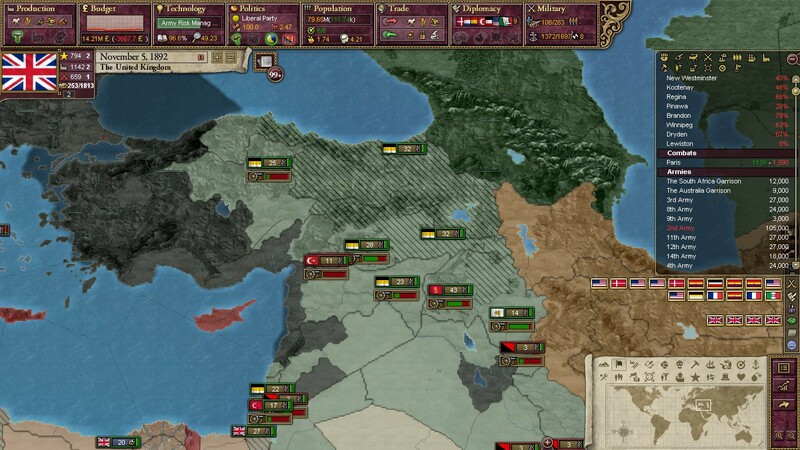 The Ottomans are, of course, remembered today largely for their modern military incompetence. 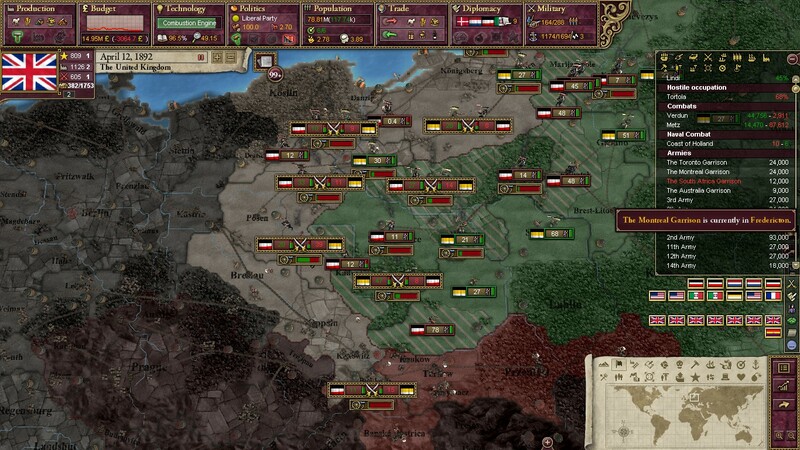 While they failed to make any serious gains against the Entente, they managed tied down Russian forces that could have been used to crush the Germans in the east. Before the relieving force managed to arrive in Metz, the British troops under Lester Smith-Dorien had surrendered; the months-long Battle of Metz was over. 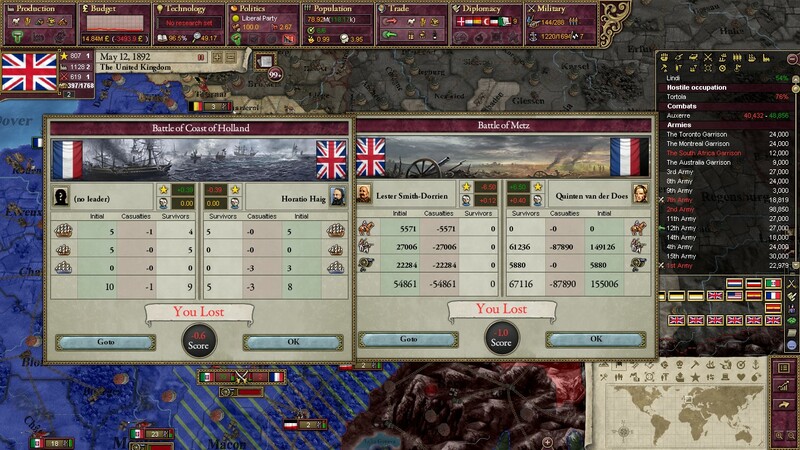 While British casualties were horrendous, the Germans and Dutch had even more. Just a year after its declaration, the Great War had proven to be one of the most bloody wars in human history. 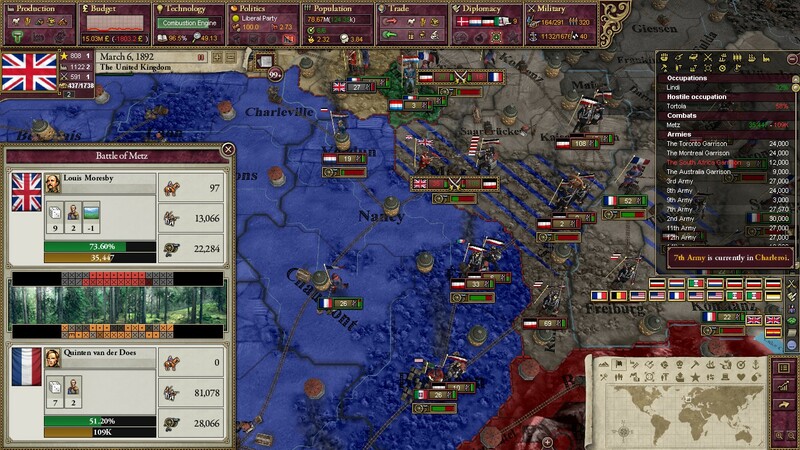 Casualty counts already numbered well over a million across all fronts, and the seriously fighting had yet to begin. On May 17th, 1892, disaster struck. 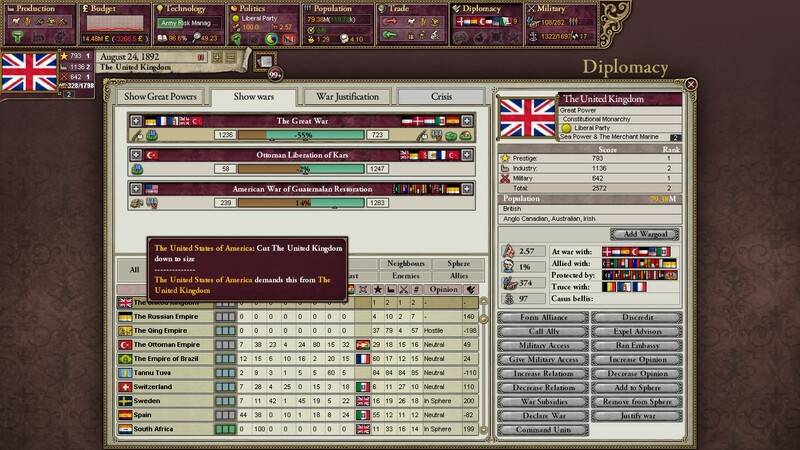 The United States Senate, in a decision that shocked Europe, declared war on the United Kingdom. President Grover Cleveland, in a speech to the American people, explained that joining the war against the Entente was "a strike against the heart of imperialism." The stated goal of the invasion was the surrender of British Honduras to Guatemala, who America had the right to protect against European aggression through the Monroe Doctrine. It was plain to see that this was a... *generous* reading of the Monroe Doctrine, but it turned out to be enough. American troops were soon on Canadian soil. 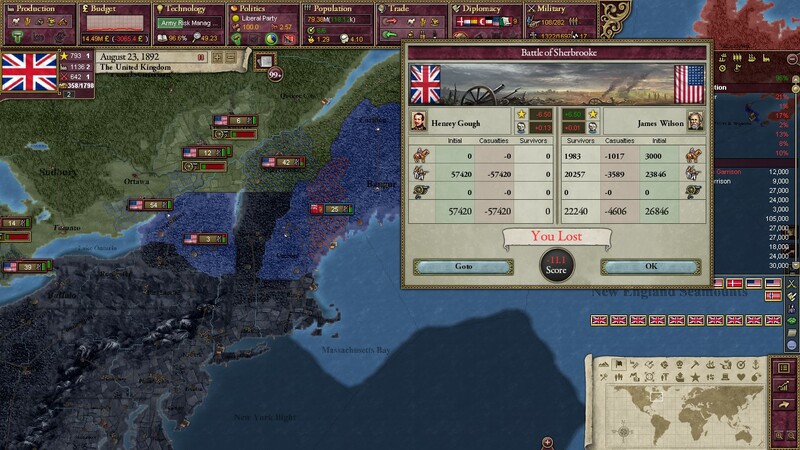 The position in Canada was certainly not advantageous for the British. While the British Empire had the grandest navy in the world and a huge population, the nation was spread so thin that transporting troops to North America was a logistical nightmare. 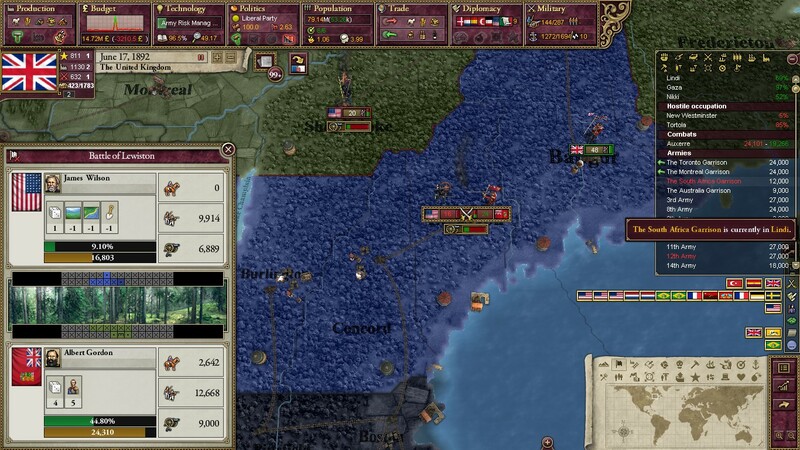 Despite this, early victories were won by the Canadian army, who crossed the border into Maine on a raiding party. Albert Gordon, a brilliant general that would go on to serve as the first President of Canada some years later, managed to defeat an initially larger American army on American soil. Alongside the 100,000 thousand or so troops present in Canada at the start of the war, conscripts were sent to the North American Front by the end of June. 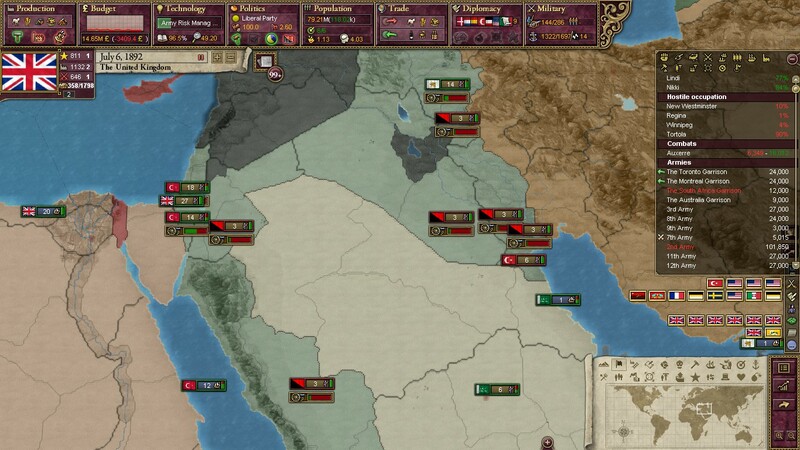 In the Middle East, the war was already going poorly for the Ottomans. 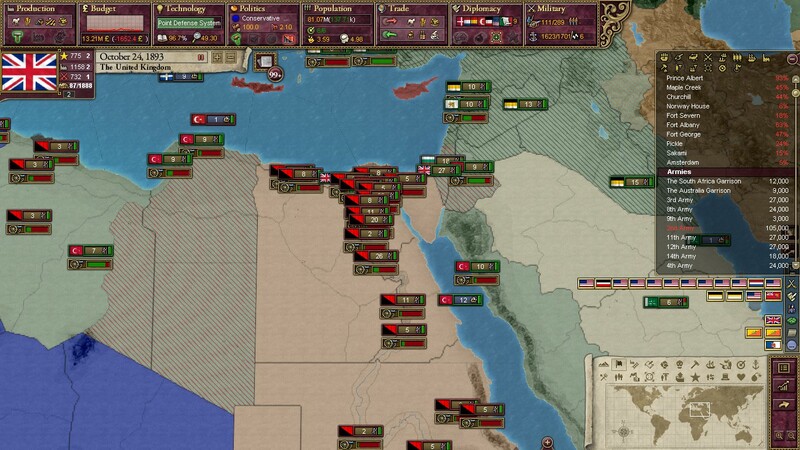 Surrounded on all sides by enemies, the British-aligned Sultanate of Egypt and the Russian-aligned Imperial State of Persia crossed Ottoman borders. Anti-Turkish partisans also began fighting against the Ottomans in Arabia. 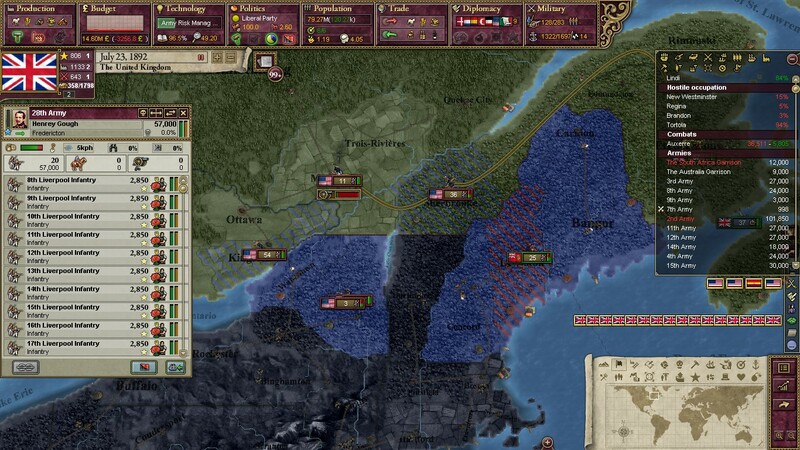 Back in Canada, the British-led Canadian Garrison attacked a much smaller American army under the command of the skilled James Wilson. Despite being outnumbered two-to-one, General Wilson and his army defended Sherbrooke, a city in southern Quebec, and used the terrain to their advantage. 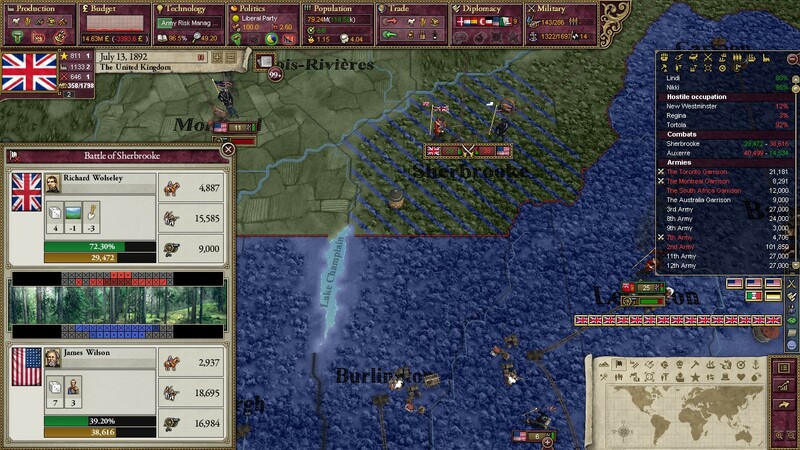 After a few weeks of fighting, the Battle of Sherbrooke concluded decisive in favor of the United States. The Canadian Garrison retreated in shambles. With failures for the Royal Army across the world, the British Society for Peace in Europe surged in popularity. More and more Liberals declared themselves anti-war, and Gladstone's govenment collapsed. A new election was to be held in 1893. The 20th, however, had just landed in New Brunswick. The army, consisting entirely of new recruits that had been drafted in the last year, was untrained, inexperienced, and entirely unfamiliar with the land. As the summer slogged on, the situation in France progressed from bad to worse. German invaders poured into Champagne and Franche-Comte, while the Italians in the south were making a push for the Bay of Biscay. 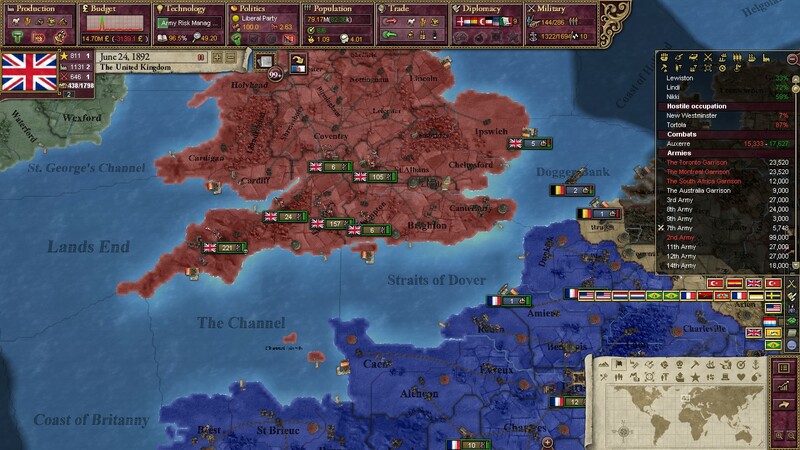 In a desperate attempt to save face for the Entente war effort, British High Command decided to send conscripts to France. 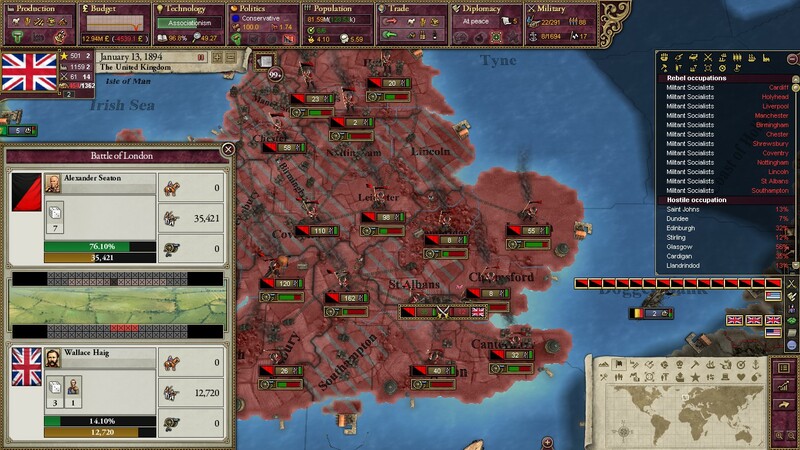 The standing armies in Britain that had continued to fight against the Germans had proven to be entirely inept, so fresh blood was clearly needed. In the Second Battle of Sherbrooke, the conscripts sent to dislodge the American position in Sherbrooke met a disastrous end, with the men either dying or being captured by the enemy to-a-man. In the dark alleys of cities like Manchester and Liverpool, a militia is created. The British Republican Guard begins to drill. Consisting largely of working class Englishmen who were aggressively anti-war, it was proof that the British people were desperate for the fighting to stop. In a speech on August 24th, President Grover Cleveland announced his intention to "file the nails of that overgrown lion." The British Empire had grown too large; so large that it presented a danger to international stability, he claimed. Alongside a similar declaration from Berlin, the Central Powers made it clear that peace would not be achieved unless the British accepted humiliating terms. On August 24th, by a slim majority aided by Tory votes, the Wartime Conscription Act of 1892 was passed in Parliament. This increased the time for which the government could legally draft civilians, and proved to be enormously unpopular. The disaffected youth, more often than not, joined the Republican Guard instead. 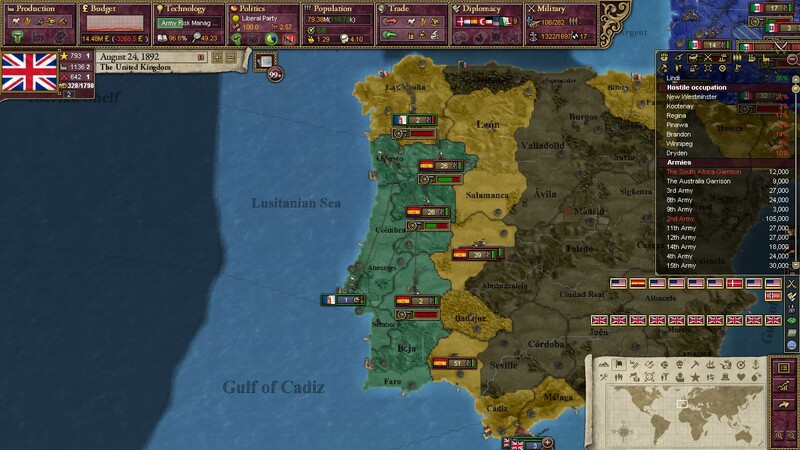 Despite months of valiant Portuguese resistance against the much larger and stronger Spanish Army, large portions of eastern Portugal were occupied by Spanish. While a small army garrison held Gibralter, it was not nearly enough to take the fight to the Spanish. By late October of 1892, the situation in France was close to total collapse. 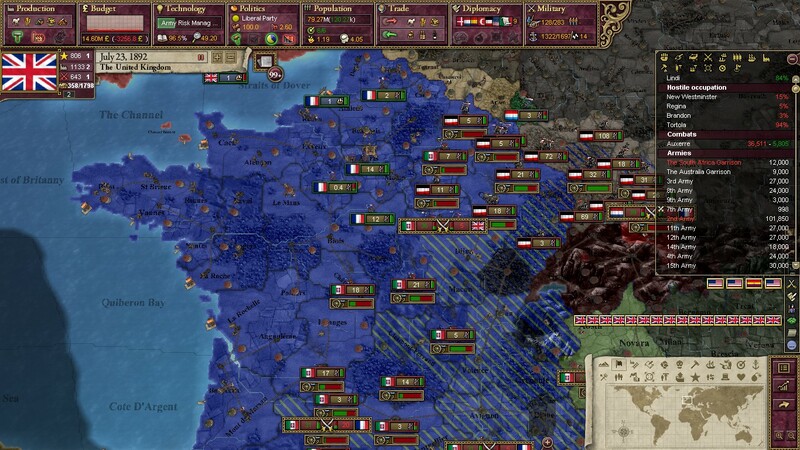 Two conscripted armies that totaled over 100,000 men were sent into the French heartland in a desperate attempt to buy time for the French Republic to organize more resistance. 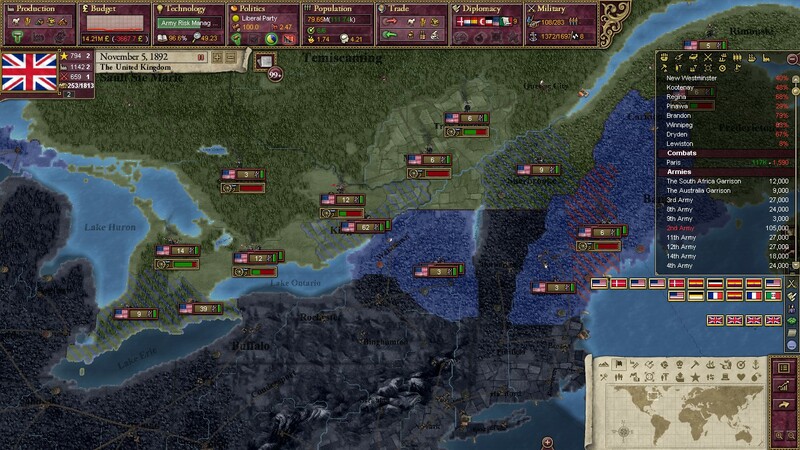 ...but in North America, the situation began to look unwinnable. 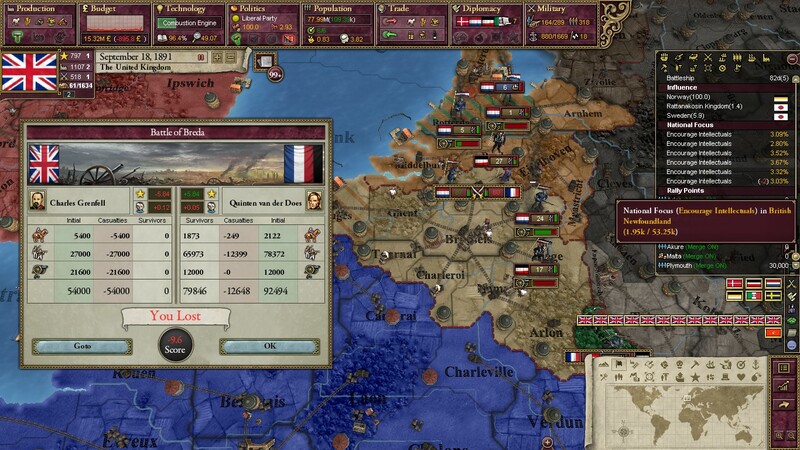 In the absolutely disastrous Battle of Melun, the Royal Army once again found itself disgraced by that scoundrel Quinten van der Does. With thousands of British held prisoner by the Central Powers thanks to countless defeats, anti-war demonstrations were held across England. In a quiet statement that was mostly swept under the rug by the British press, any and all British officers that were still fighting alongside the Canadian Army were dismissed and sent back to the Britain. 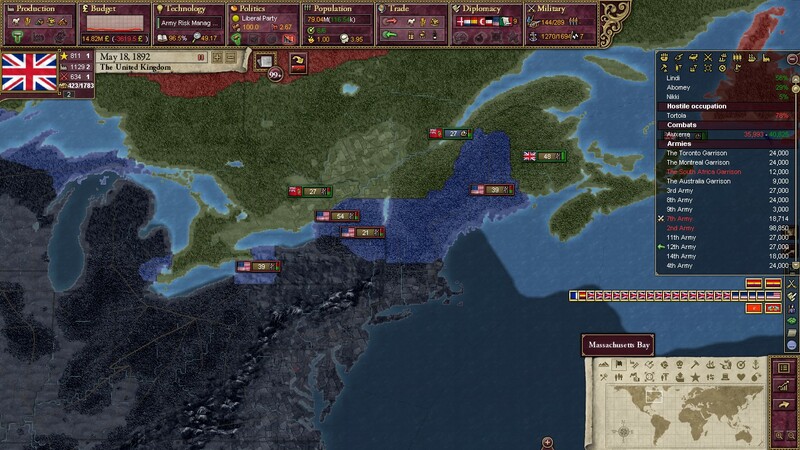 The order massively angered the Canadians, who felt that their colonial masters had betrayed them. 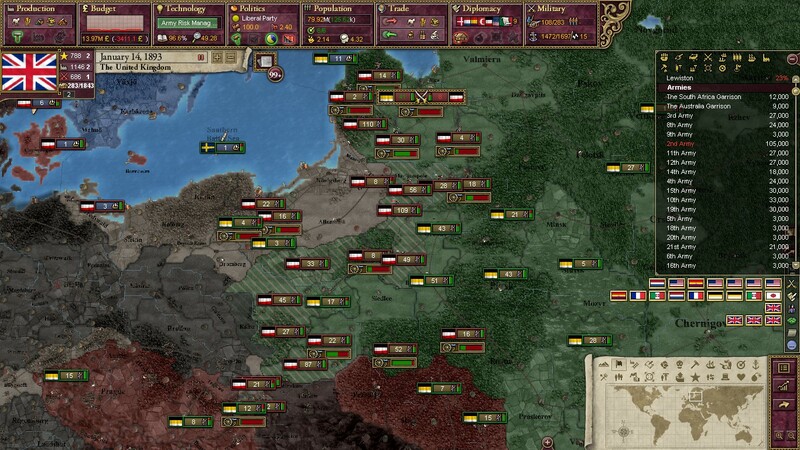 As 1893 dawned, the Eastern Front remained stagnant. Brutal fights in the freezing trenches of Poland resulted in millions of lost lives while Russian peasants starved. Fearing open rebellion against his government by the peasantry, Tsar Alexander III, dubbed the "Warmaker" by his own people, began to talk with German emissaries about the prospect of peace. One last expedition to France was planned. 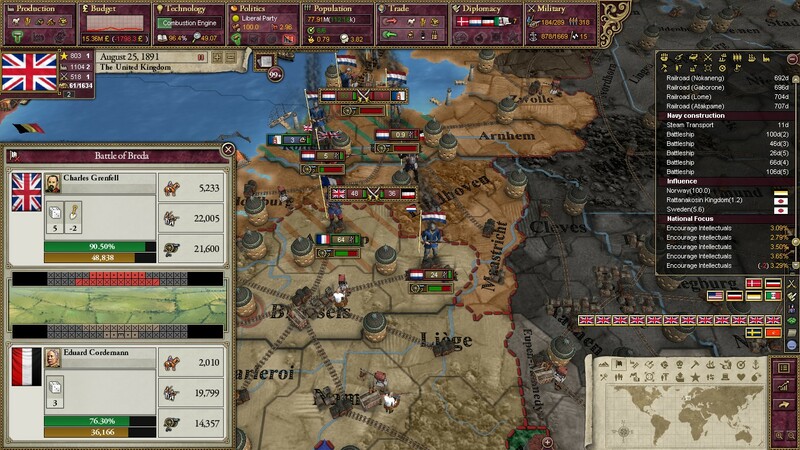 Another 100,000 men would be sent to Paris, which was under siege by a Dutch army. 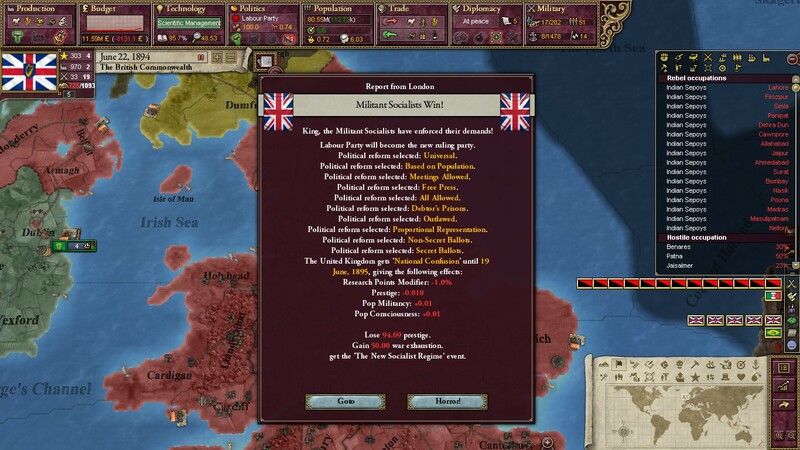 On February 4th, 1893, Britain voted, and the result shocked the nation. Despite an overall majority for the Liberal Party led by Archibald Primrose, Earl of Roseberry, at the behest of King Charles III, a "War Government" was created. Robert Gascoyne-Cecil, Marquess of Salisbury, the leader of the Conservatives in the House of Lords, was installed as the Prime Minister of the "coalition." This was the final straw for the anti-war coalition. Just three days after the election, the British Republican Front was established in the House of Commons. While just around 15% of the MPs supported this fringe movement, it was broadly supported by the common man, who believed that the king had overstepped his bounds by forcing a Conservative PM on Westminster. Meanwhile, in Paris, Italian reinforcements arrived. "All is lost. We will not hold. We must seek peace before we are destroyed completely. All is lost." 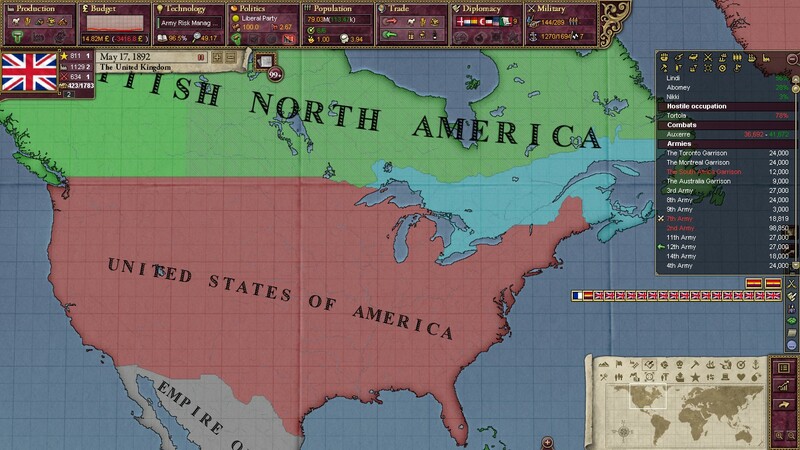 The situation in Canada was equally miserable. Wherever the French tricolor waved, someone nearby wanted to angrily tear it down. Africans who rallied around the doctrine of communism as the force that would liberate them from French imperialism had risen up across the Maghreb. 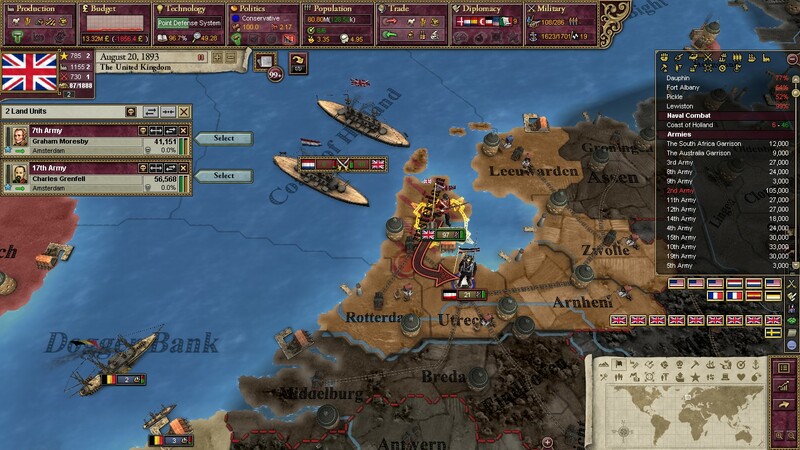 After some debate in London, one last desperate attempt to relieve the pressure on France was attempted: an invasion of the Netherlands. By striking closer to the German Empire, PM Salisbury and higher-ups of the Royal Army hoped to draw attention away from the occupation of France. British conscripts landed a few miles north of Amsterdam. With Russian will in the east broken, the Tsar became desperate for peace before large tracts of his nation could be occupied. 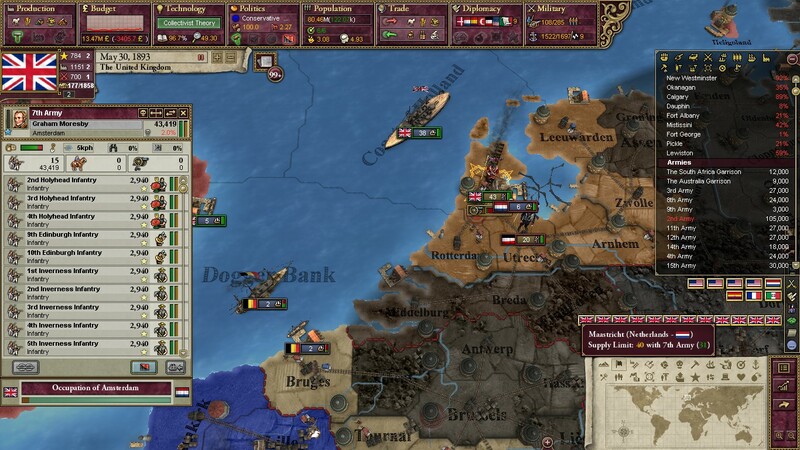 After a few months, the Royal Army successfully managed to occupy and clear out Amsterdam. 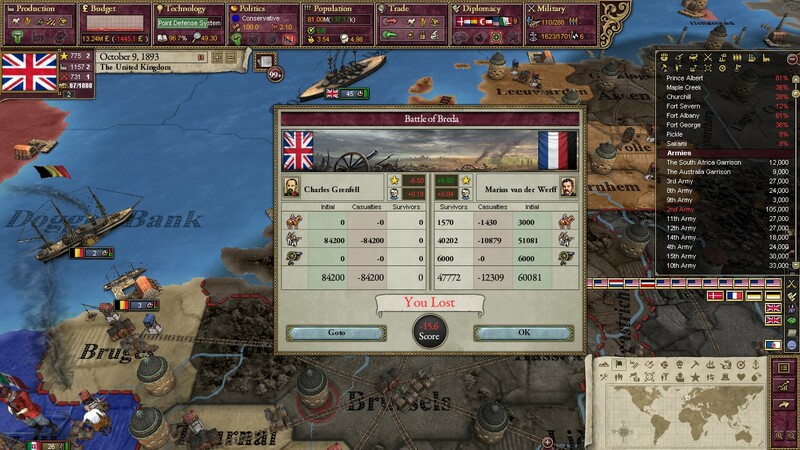 The Prime Minister attempted to use the victory as a way to take the public's attention away from the failure in France and show that the war was far from lost. A smaller German army was stationed in Utrecht. The Royal Army advanced. After a brief and successful battle, the Germans were dislodged from their positions in the Dutch countryside. Another great victory was touted in London newspapers. 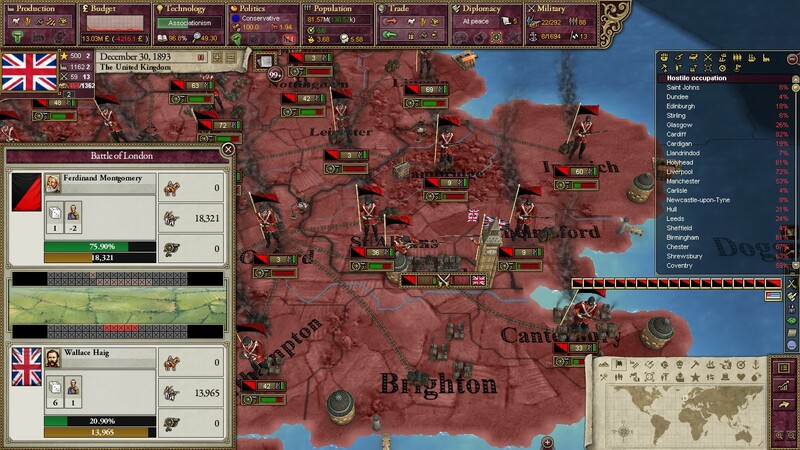 The British Republican Guard, now openly parading in major cities, was on the verge of revolt. 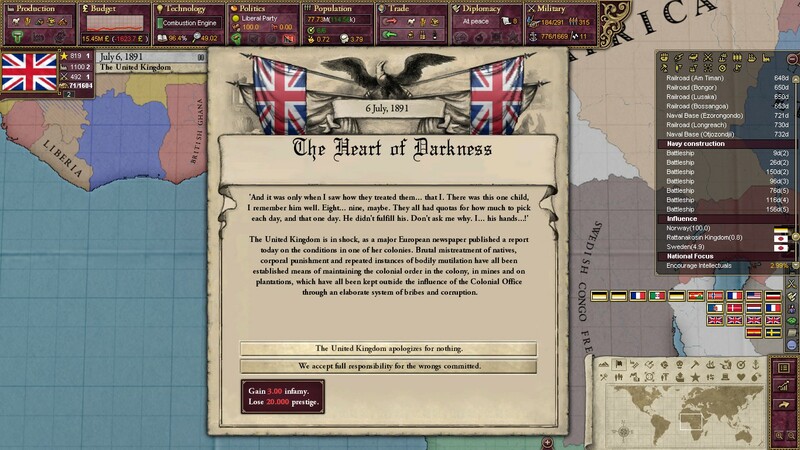 "This is the last gasp for the British Empire, my love. I fear for my own life, and for the lives of all those in London who would suffer should we fail. On the field near Breda, we shall either save face or we shall crumble to nothing." The Second Battle of Breda was yet another disaster for the Crown. By October of 1893, it was hard to find a single man on the street that had anything positive to say about the Great War. 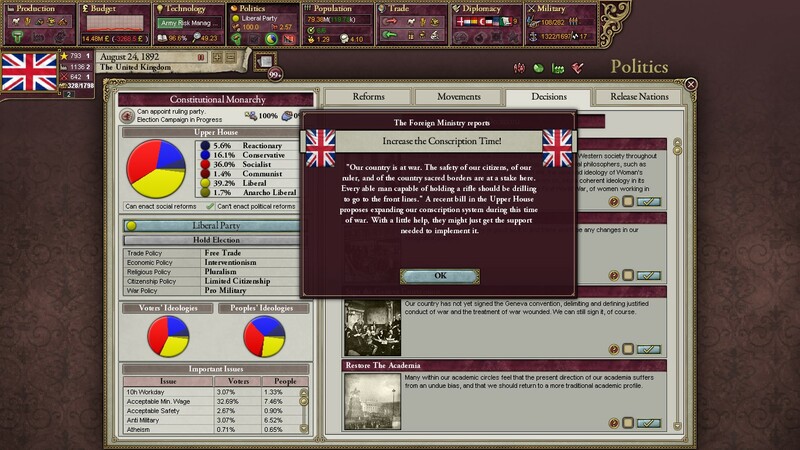 Fearing revolution, PM Salisbury agreed that the war needed to be brought to a halt. 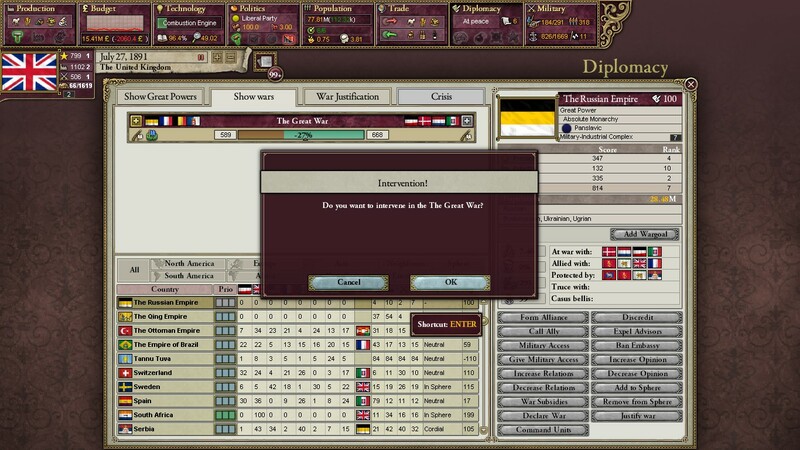 Russia, France, and the United Kingdom entered tentative peace talks with the Central Powers in Hamburg. While talks were ongoing in Hamburg, the powder keg that was Egypt finally exploded. Demonstrations against British colonial dominion broke out in major cities, eventually turning into open rebellion. On November 22nd, after more than two years of fighting, the Treaty of Hamburg was signed by all participants of the Great War. 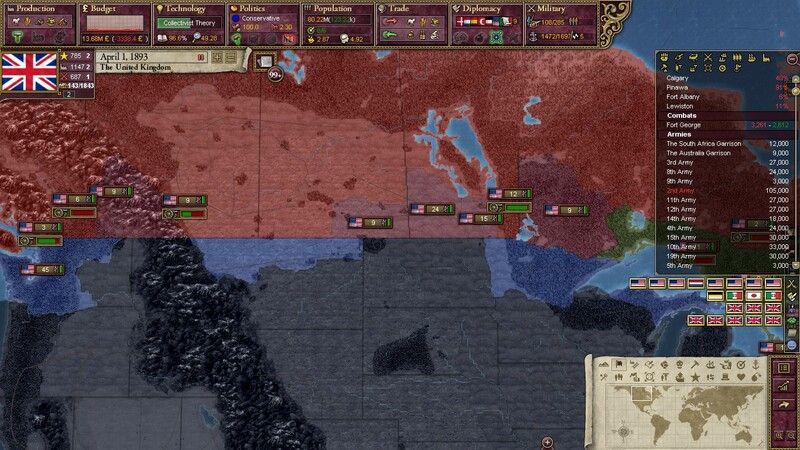 While the treaty did not end the separate conflicts the Entente had with the Ottoman Empire and the United States, November 22nd is generally agreed to be the day that Great War ended. France, the nation that had bled the most, was the nation that suffered the most. The independent Breton Republic was established and guided by the Germans, while Corsica and a few African holdings were ceded to Italy and Spain, respectively. 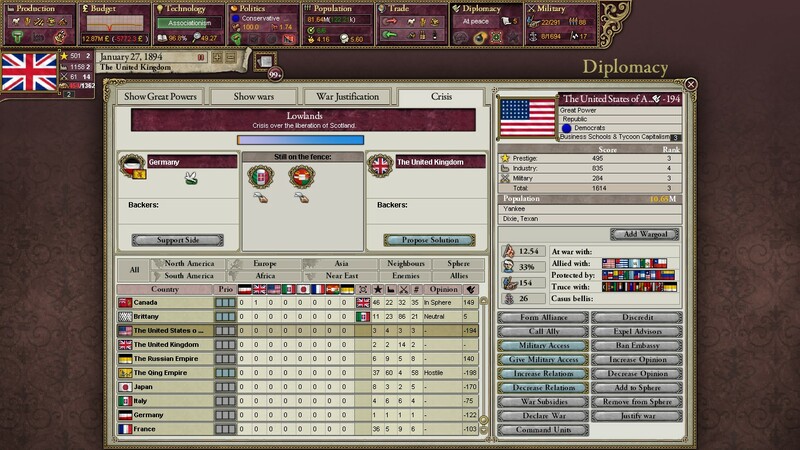 All Entente powers agreed to "forced disarmament," forbidding these nations to continue their military buildup and significantly restricted how big their armies could be. In addition to this, the Germans and Italians demanded monstrously large monetary reparations from the Entente. Both of these provisions would be renegotiated after five years. The last clause of the treaty, the "Right to Revise" provision, caused the most anger. This gave the Central Powers a window of twenty years to "revise and rewrite the treaty as the Imperial German Government sees fit." While the wording was vague, its intention was simple: it allowed the Germans and Italians to demand further concessions is they so desired. While Britain had not lost any territory to the Central Powers outright, it had been thoroughly humiliated. 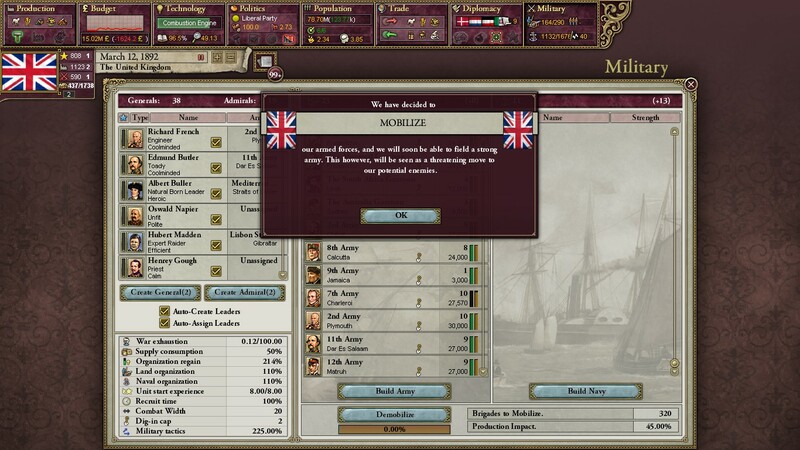 Negotiations with the American government began as Britain demobilized. 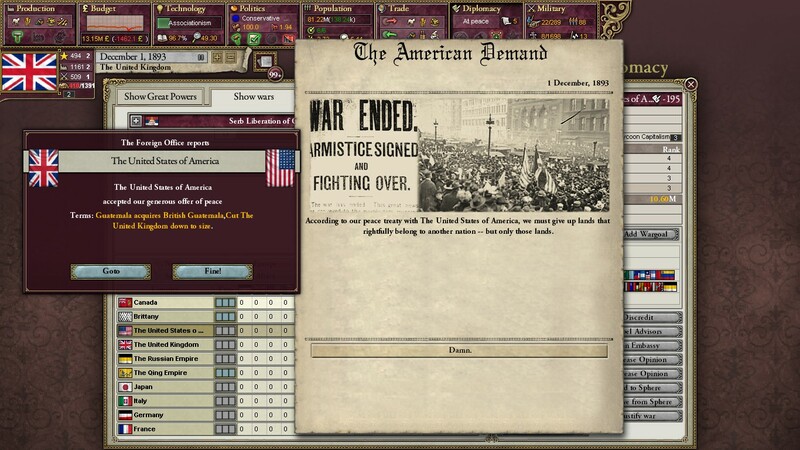 On December 1st, 1893, peace with America had been made. 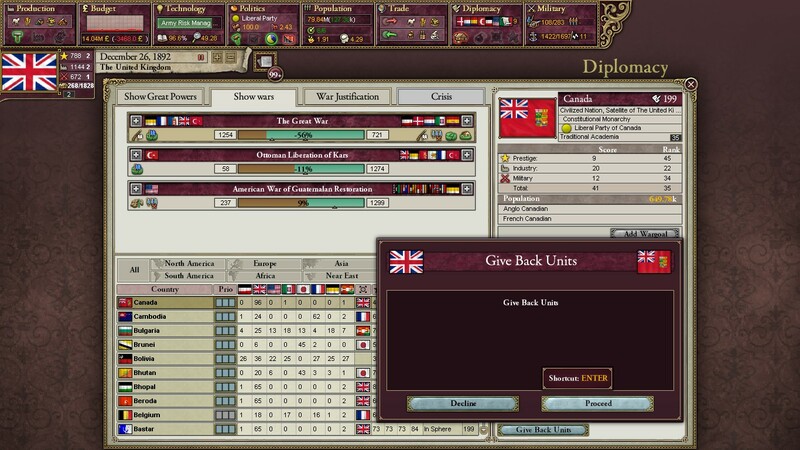 Britain would cede their colony to Guatemala and agreed to further military restrictions. Popularity for the Democrats in the United States skyrocketed. "To use the words of my good friend and predecessor Grover Cleveland," said American President Adlai Stevenson, "We have filed the nails of the lion. Britain shall never again be a threat to liberty if the United States may have a say in the matter." In the first "revision" of the Treaty of Hamburg, Germany demanded Heligoland, a small naval base off of the German coast. While Westminster had initially wanted to receive a German colonial holding in echange, the message from Berlin was simple: Comply, or be invaded. 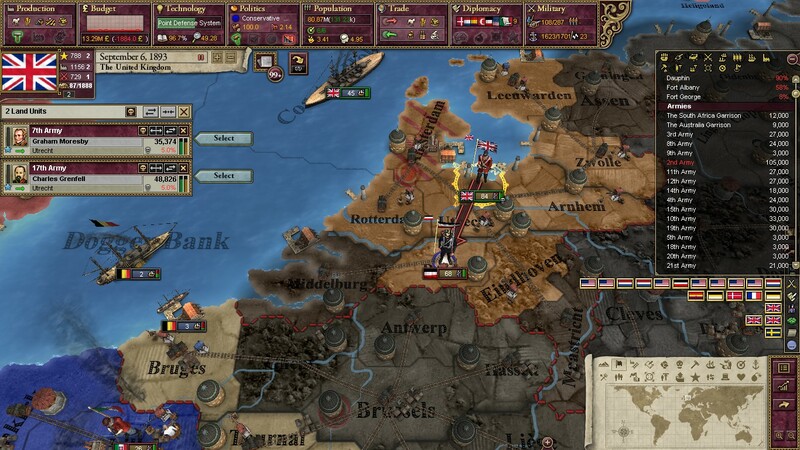 Not even a month after the signing of the Hamburg Treaty, on December 17th, the British Civil War began. The British Republican Guard rose up across England and Scotland, armed with stolen rifles smuggled back from the war, pikes, and whatever rudimentary weapons they could get their hands on. King Charles III and the rest of the royal family fled to Canada, where they were turned away by the Canadian government. After some months, they finally settled in Russia, where the sympathetic Romanovs gave them asylum. The Tory government in Westminster stood its ground, however, as most Liberals and every Labour politician vacated their seats. Prime Minister Salisbury planned on defeating the rebels, who he dismissed as "the delusional grandsons of Chartists." The last scraps of the Royal Army stationed in London attempted to fight off the mob, aided by local police. The vicious Battle of London would last for over a month, with violent street-to-street fighting engulfing most of the city. 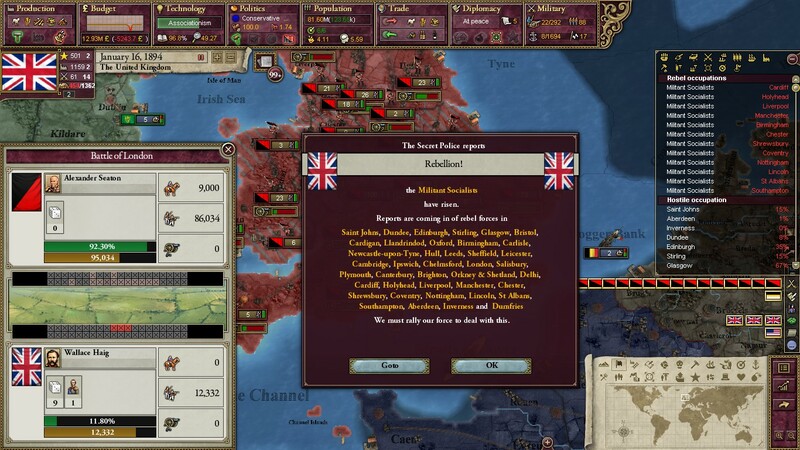 Within days, public order in the British Isles had almost entirely broken down. While the loyalists commanded by Wallace Haig managed to hold onto Westminster itself and a few surrounding neighborhoods, the rebel onslaught seemed endless. As the cause of the monarchists looked grim, hundreds of thousands of men and women took up the cause of the Republican Front. 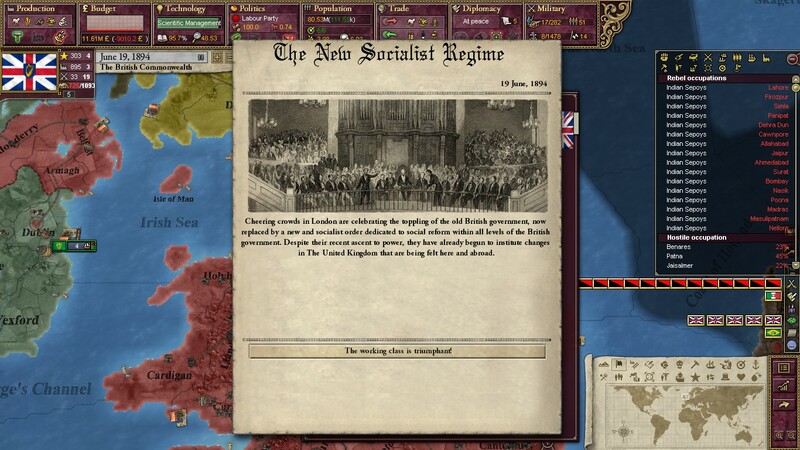 Liberal politicians defected to the movement over the course of a few weeks, with local "Republican Orders" being founded in big cities across the isle. Scottish rebels, led primarily by Keir Hardie, occupied Edinburgh. In a move that shocked even most Republicans, Saint Andrew's Cross was raised across the land. 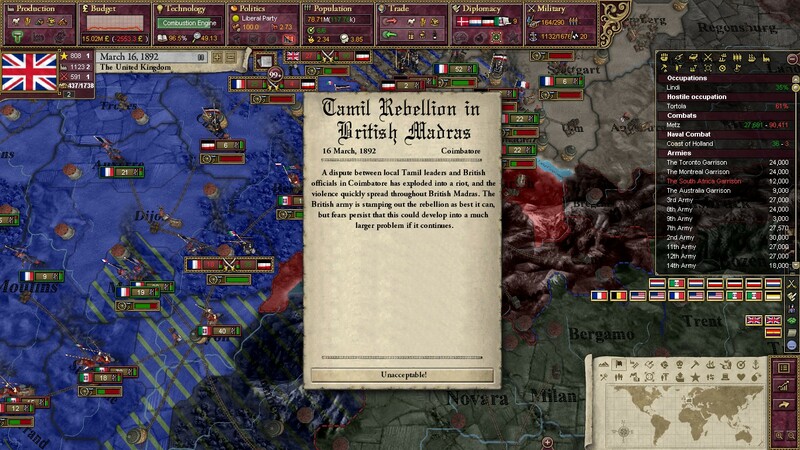 While Great Britain burned with revolution, so too did India. 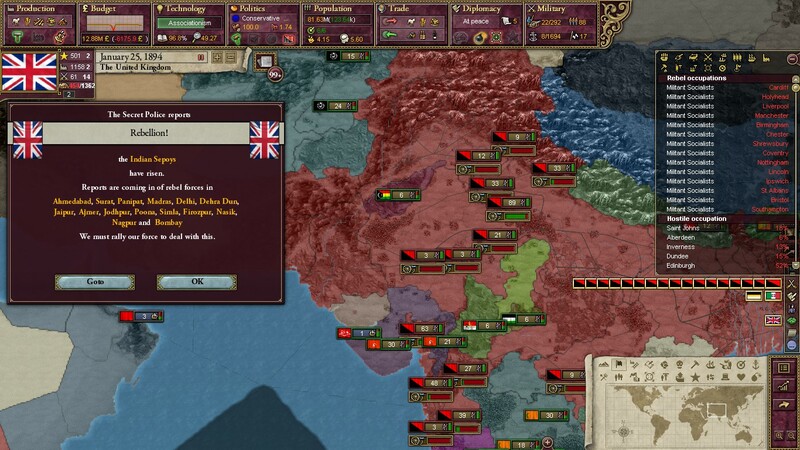 Local Indian nationalists revolted against crumbling British authority in the subcontinent, and the Republican Front's general anti-imperialist leanings meant that no serious attempts were made by this new order to rein in the continent. 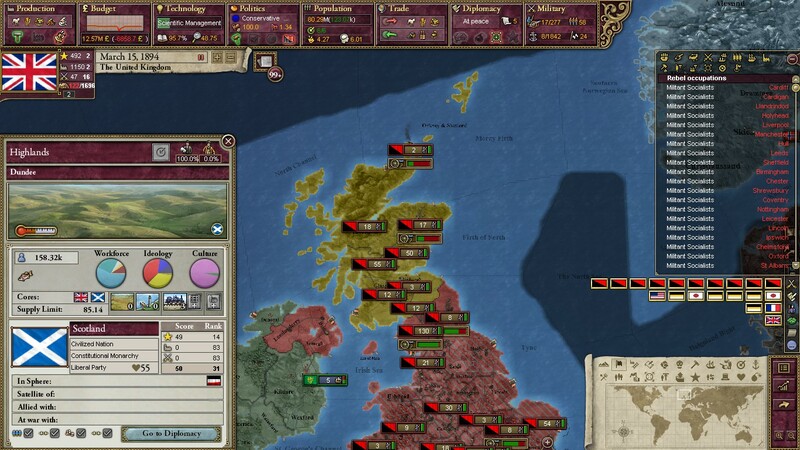 On January 27th, the Republic of Scotland declared its independence from the United Kingdom. 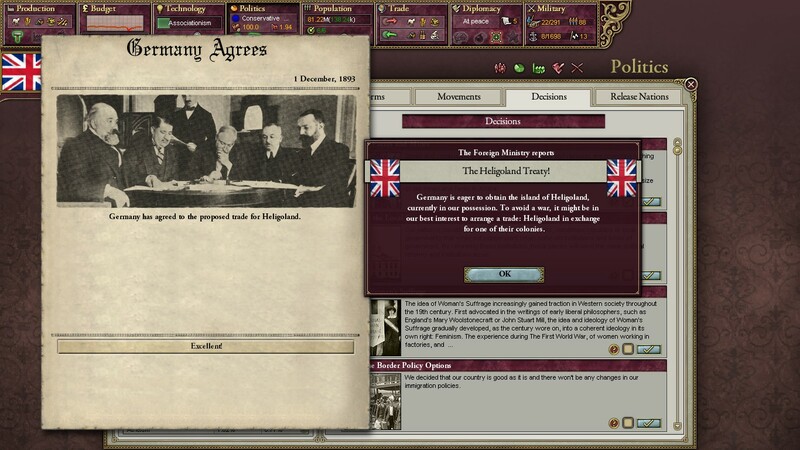 Germany, eager to further weaken the crumbling British Empire, agreed to support the Scottish cause. After a month of fighting, the Royal Army retreated to Westminster itself. The Republican Guard, not eager to storm the symbol of English democratic government, decided to besiege the loyalists instead. Military strongmen for the Republicans began to emerge. Alexander Seaton, Alexander Havelock, Charles Battenburg, and Zachary Cockburn were the leading minds of the insurrection. These men met with Republican politicians in Oxford and began to discuss the formation of a new nation. A general congress of 217 representatives assembled in Oxford and declared themselves the British Provisional Government. Thomas Burt, a compromise candidate between the more radical Labour Party and the moderate Liberals, was chosen to be its first leader. The man was a prominent trade unionist and a former MP, commanding the kind of respect and authority that the new government wished to establish. 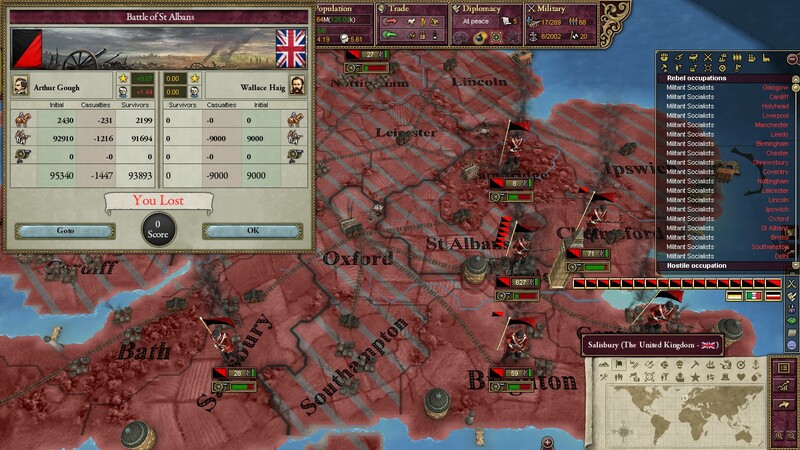 The last major monarchist civillian group was crushed in St. Albans by March. 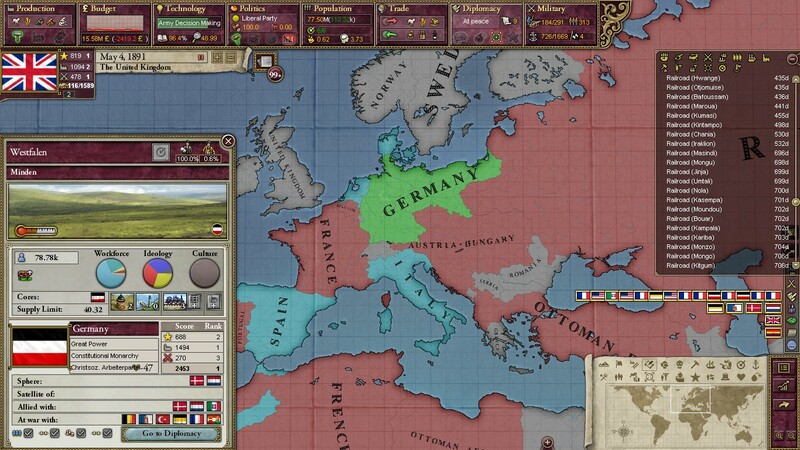 After two months of Scottish-German negotiation, Berlin presented the British Provisional Government with an ultimatum: Scotland would become an independent kingdom, with a minor German noble taking the crown. 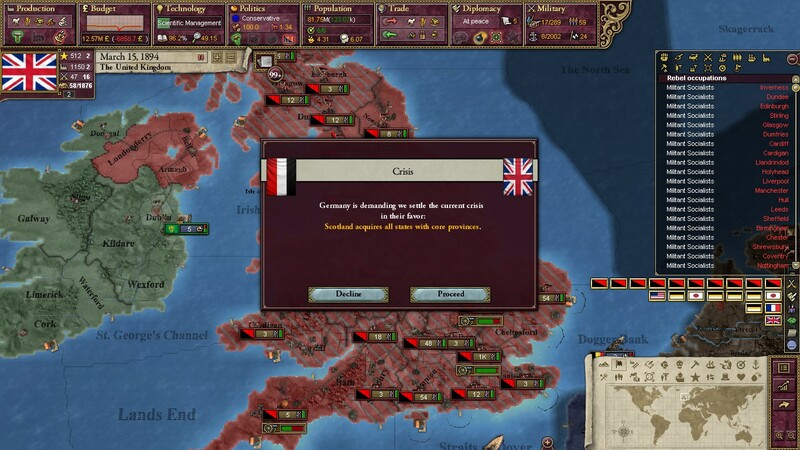 In exchange for this, the German government would recognize the Republicans as the legitimate government of England, Wales, and Northern Ireland. Thomas Burt, given final authority over the matter, agreed to the German proposal, believing that refusal would lead to a German invasion. After a drawn-out stalemate that lasted several more months, Prime Minister Robert Gascoyne-Cecil, Marquess of Salisbury, surrendered on June 19th, 1894. In exchange for complete surrender, the occupants of Westminster were allowed to go free, albeit under close supervision. The British Provisional Government relocated to the old House of Commons. While there was nothing resembling a real constitution yet drafted, Thomas Burt was formally sworn in as the first "Director" of a Republican Britain. The government was to be a coalition between Labour and the Liberals, who had now styled themselves as "Liberal-Republicans" to differentiate themselves from the old party that had propped up the Great War. The violence in England, however, was not even close to being over. Thank you for reading part one! 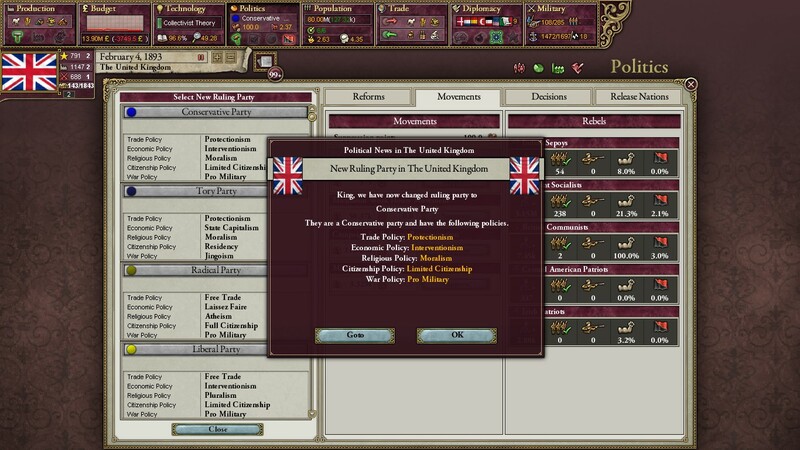 Check back in next time to see the conclusion of the British Civil War as the Commonwealth takes its first baby steps.